T cells are a category of lymphocytes that differ from other lymphocytes because of the unique T cell receptor (TCR) present on the cell surface. 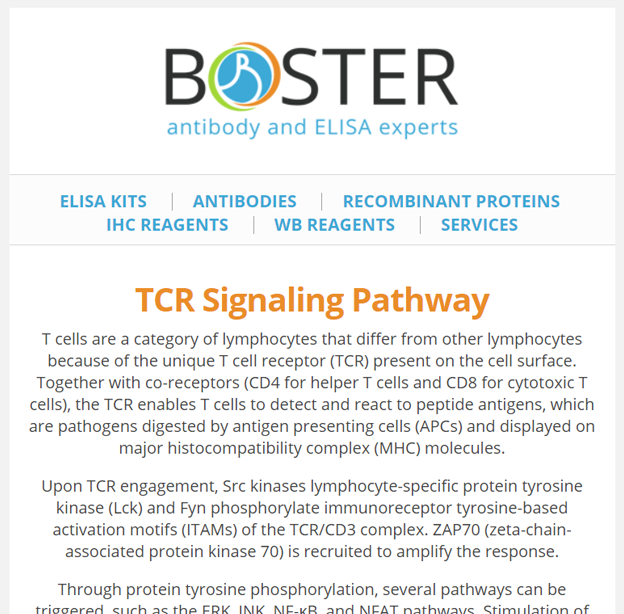 Together with co-receptors (CD4 for helper T cells and CD8 for cytotoxic T cells), the TCR enables T cells to detect and react to peptide antigens, which are pathogens digested by antigen presenting cells (APCs) and displayed on major histocompatibility complex (MHC) molecules. 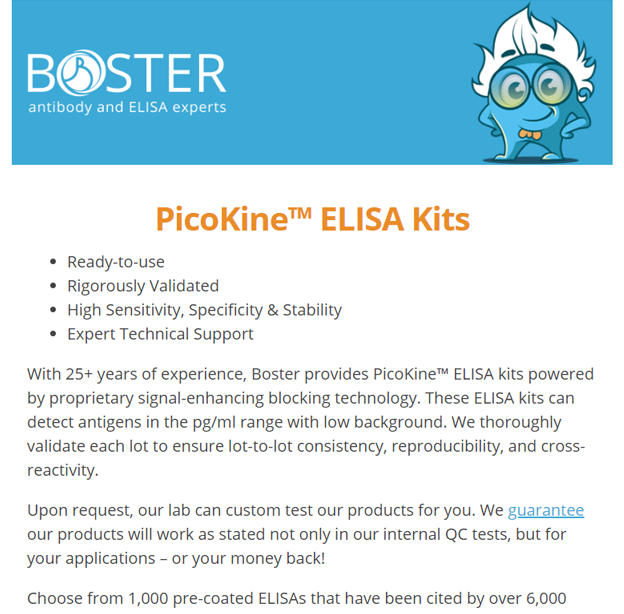 With 25+ years of experience, Boster provides PicoKine™ ELISA kits powered by proprietary signal-enhancing blocking technology. These ELISA kits can detect antigens in the pg/ml range with low background. We thoroughly validate each lot to ensure lot-to-lot consistency, reproducibility, and cross-reactivity. 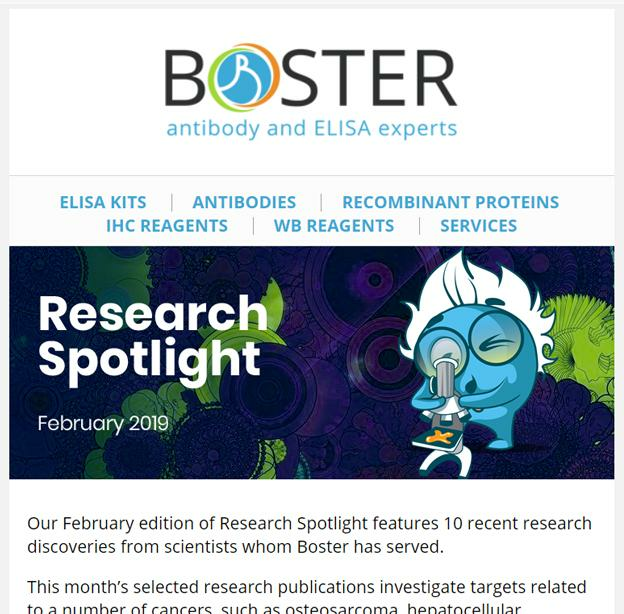 Our February edition of Research Spotlight features 10 recent research discoveries from scientists whom Boster has served. This month’s selected research publications investigate targets related to a number of cancers, such as osteosarcoma, hepatocellular carcinoma, pancreatic carcinoma, and glioblastoma, and also include studies that examine targets of Parkinson’s disease and type 2 diabetes mellitus. Today is World Cancer Day. Each year, organizations and people from around the world unite on February 4th to raise awareness about cancer. According to the American Cancer Society, cancer mortality had dropped 27% from 1991 to 2016. This decline is mostly attributed to decreases in smoking and advancements in early cancer detection and treatment. As the most abundant free amino acid in the plasma, glutamine participates in a variety of biochemical processes, such as protein and lipid synthesis, cellular energy production, and nitrogen and carbon donation. 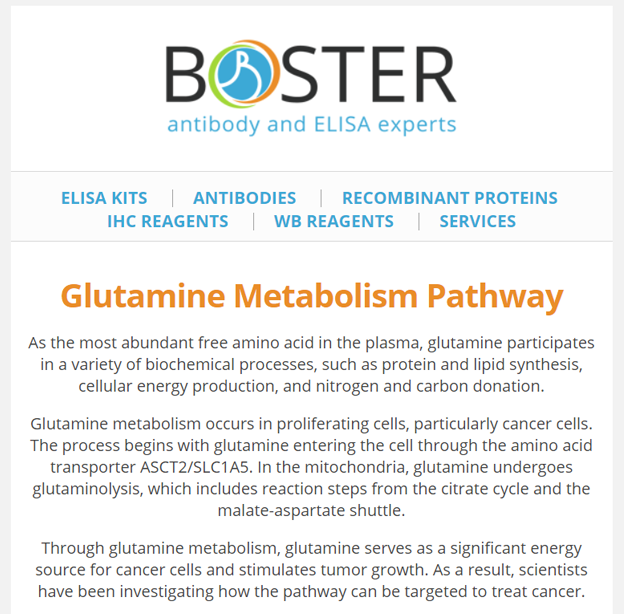 Glutamine metabolism occurs in proliferating cells, particularly cancer cells. The process begins with glutamine entering the cell through the amino acid transporter ASCT2/SLC1A5. In the mitochondria, glutamine undergoes glutaminolysis, which includes reaction steps from the citrate cycle and the malate-aspartate shuttle. In the lab, researchers invest time and effort to optimize the sample preparation and sample staining processes of IHC. When successful, the results produce a strong and specific signal. However, how do we know the results have been interpreted correctly? 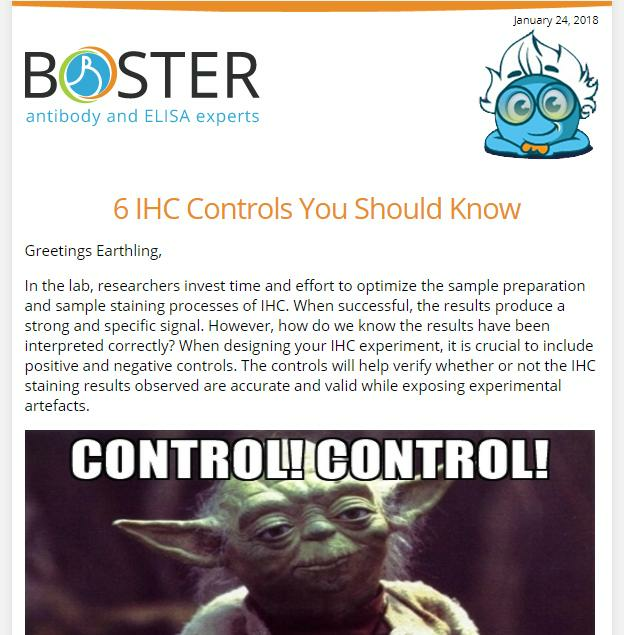 Currently, there are 6 established IHC controls that will help you determine the specificity of the observed antibody staining. 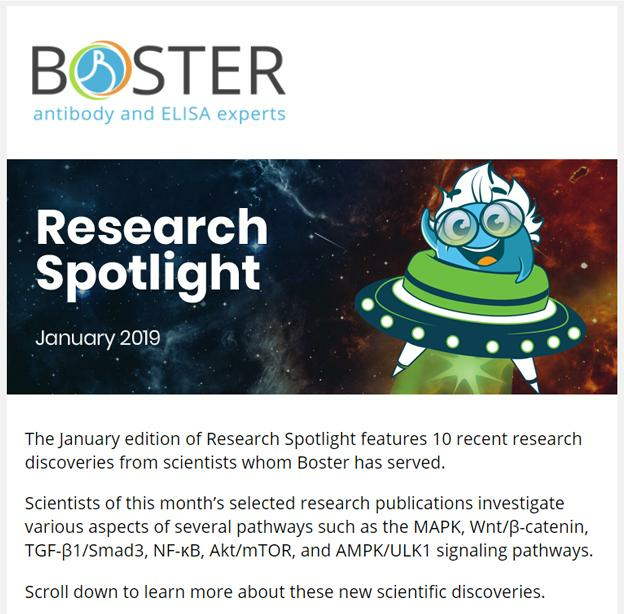 The January edition of Research Spotlight features 10 recent research discoveries from scientists whom Boster has served. Scientists of this month’s selected research publications investigate various aspects of several pathways such as the MAPK, Wnt/β-catenin, TGF-β1/Smad3, NF-κB, Akt/mTOR, and AMPK/ULK1 signaling pathways. 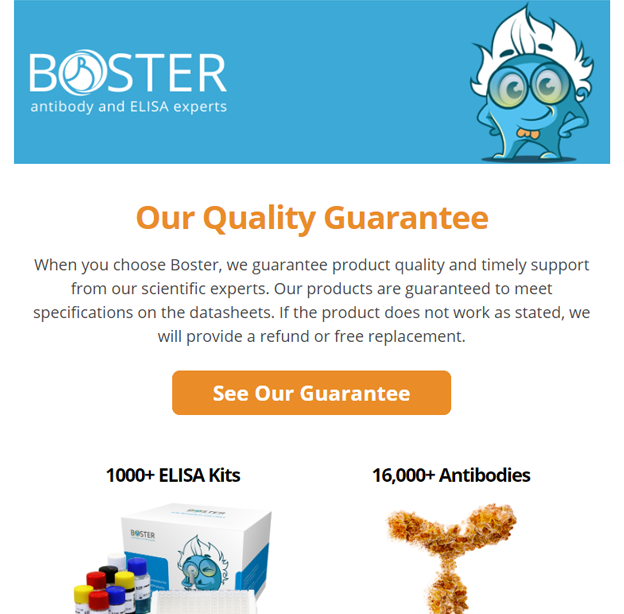 When you choose Boster, we guarantee product quality and timely support from our scientific experts. Our products are guaranteed to meet specifications on the datasheets. If the product does not work as stated, we will provide a refund or free replacement. Happy New Year! 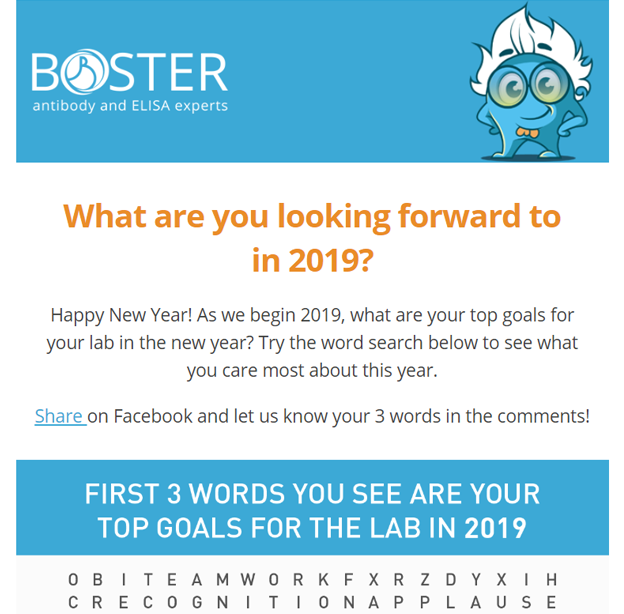 As we begin 2019, what are your top goals for your lab in the new year? Try the word search below to see what you care most about this year. Merry Christmas and Happy Holidays from all of us at Boster! May peace, prosperity, and happiness be yours throughout the holidays and new year. 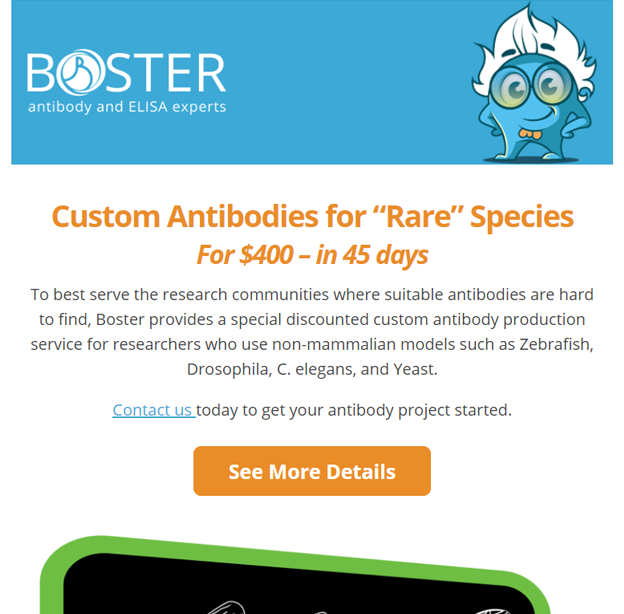 To best serve the research communities where suitable antibodies are hard to find, Boster provides a special discounted custom antibody production service for researchers who use non-mammalian models such as Zebrafish, Drosophila, C. elegans, and Yeast. 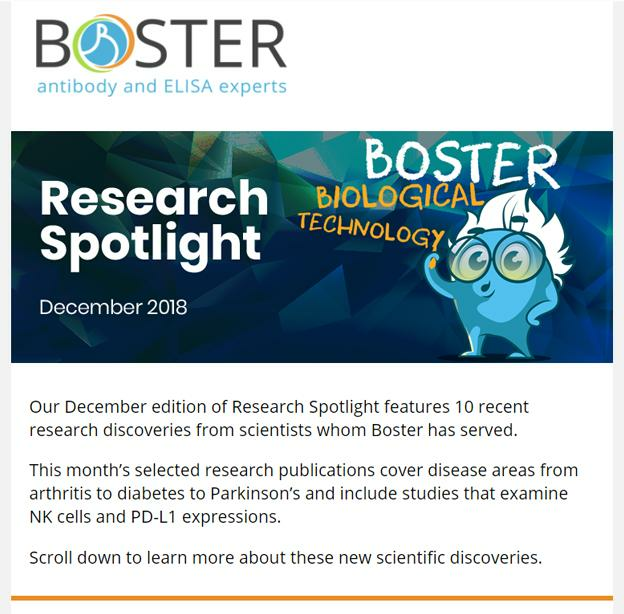 Our December edition of Research Spotlight features 10 recent research discoveries from scientists whom Boster has served. This month’s selected research publications cover disease areas from arthritis to diabetes to Parkinson’s and include studies that examine NK cells and PD-L1 expressions. 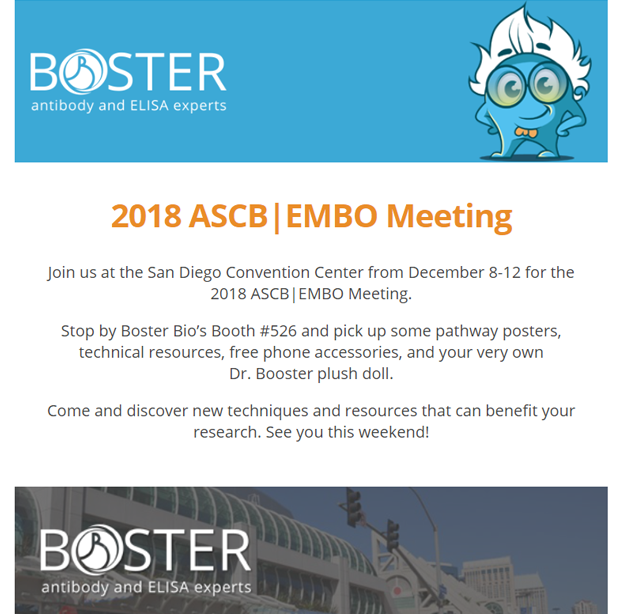 Join us at the San Diego Convention Center from December 8-12 for the 2018 ASCB|EMBO Meeting. 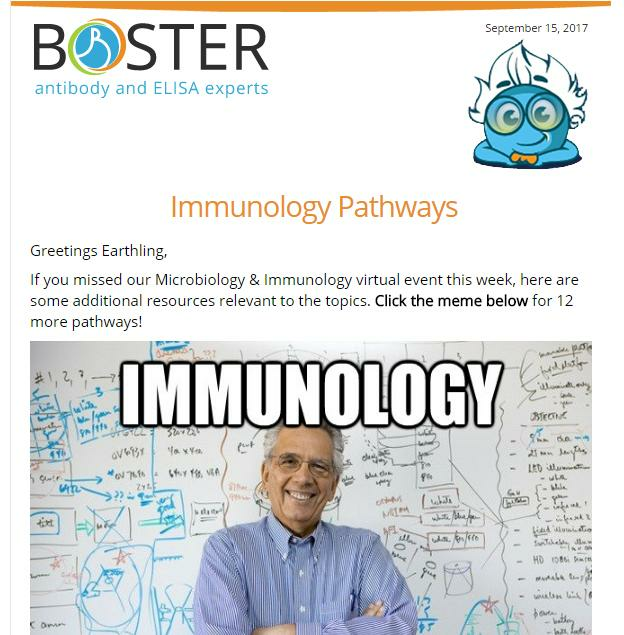 Stop by Boster Bio’s Booth #526 and pick up some pathway posters, technical resources, free phone accessories, and your very own Dr. Booster plush doll. Flow cytometry is a popular cell biology technique that utilizes laser-based technology to count, sort, and profile cells in a heterogeneous fluid mixture. It is a powerful tool that allows simultaneous multiparametric analysis of the physical and chemical characteristics of up to thousands of particles per second. This Thursday will be Thanksgiving Day in America. We’d like to take this opportunity to thank you for being a subscriber. We’re always open to feedback and we appreciate those who have taken the time to contact us. We strive to provide useful information for you in our newsletters and welcome any recommendations you may have for us. 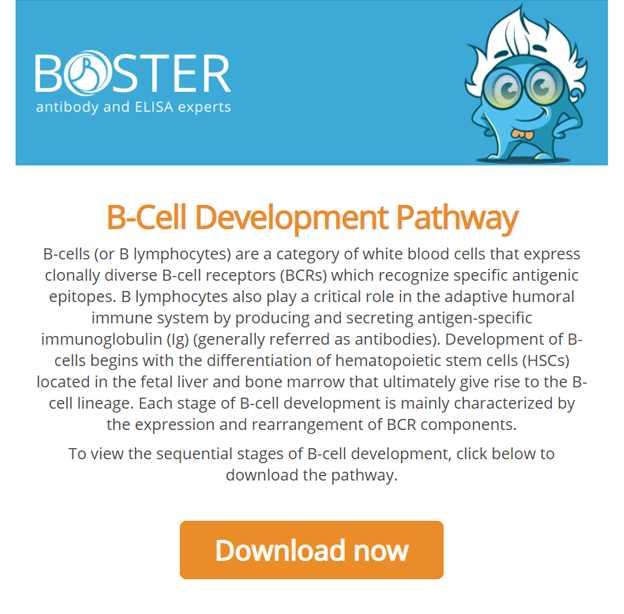 B-cells (or B lymphocytes) are a category of white blood cells that express clonally diverse B-cell receptors (BCRs) which recognize specific antigenic epitopes. B lymphocytes also play a critical role in the adaptive humoral immune system by producing and secreting antigen-specific immunoglobulin (Ig) (generally referred as antibodies). 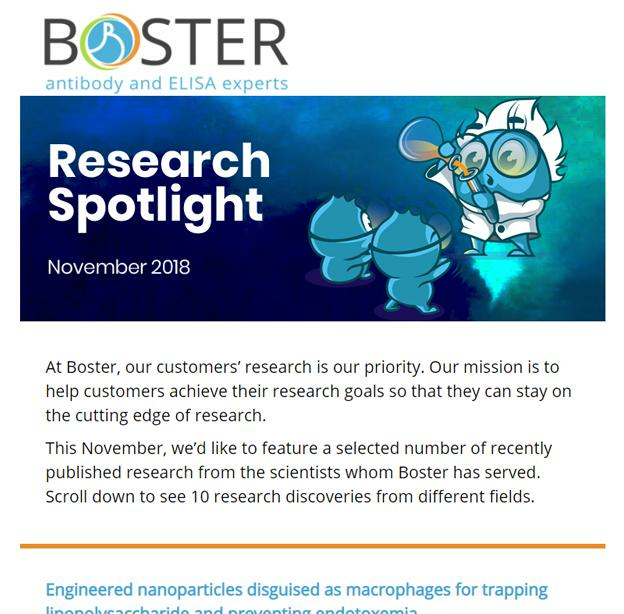 At Boster, our customers’ research is our priority. Our mission is to help customers achieve their research goals so that they can stay on the cutting edge of research. 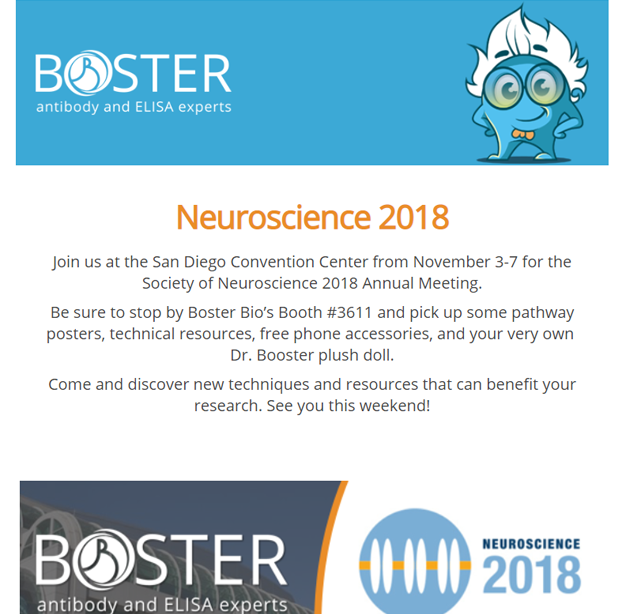 Join us at the San Diego Convention Center from November 3-7 for the Society of Neuroscience 2018 Annual Meeting. 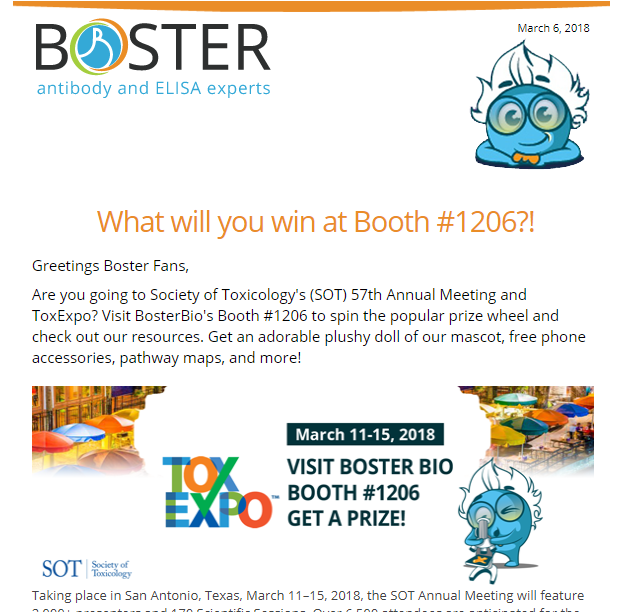 Be sure to stop by Boster Bio’s Booth #3611 and pick up some pathway posters, technical resources, free phone accessories, and your very own Dr. Booster plush doll. The common problem for all fluorescence-based cell detection methods is the cells’ natural fluorescence. Cellular autofluorescence is due to the presence of various biological structures, such as collagen, elastin, NADPH, flavins, mitochondria, and lysosomes, which usually absorb in UV to blue range (355-488 nm) and emit in the blue to green range (350-550 nm). Therefore, autofluorescence interferes with analysis by reducing signal sensitivity and resolution of fluorochromes that operate in that range – FITC, GFP, and Pacific Blue to name a few. Allergies are when the body’s immune system has a hypersensitive reaction towards innocuous substances called allergens. Common allergens include dust mites, pollen, mold, food, and animal dander, which could trigger allergic disorders such as allergic asthma, hay fever, allergic rhinitis, anaphylaxis, allergic conjunctivitis, and contact dermatitis. 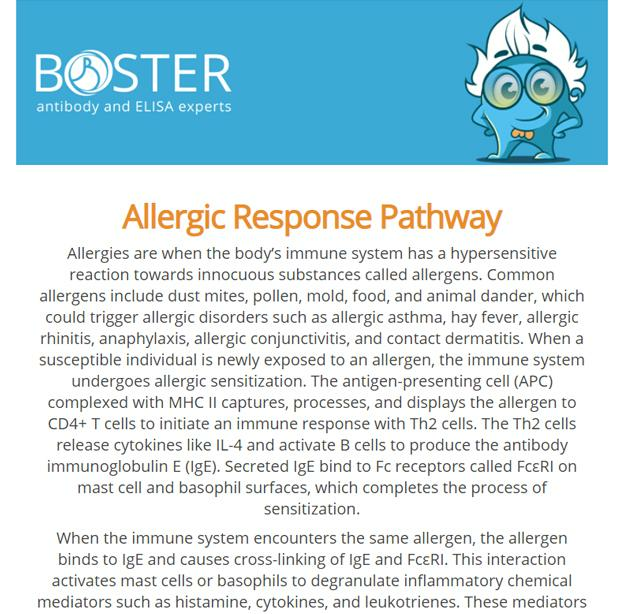 When a susceptible individual is newly exposed to an allergen, the immune system undergoes allergic sensitization. The ELISA is one of the most commonly performed bioassays that produces qualitative, semi-quantitative, and quantitative data. In order to obtain quantitative ELISA data, constructing the ELISA standard curve is an important and crucial process to estimate the target protein concentrations for your samples. In 2018, more than 266,000 women will be diagnosed with breast cancer in the United States. According to the American Cancer Society, over 40,000 women will die from breast cancer this year. It is the second leading cause of cancer death in American women. Breast cancer is the most common cancer in women in the US and worldwide, regardless of race or ethnicity. 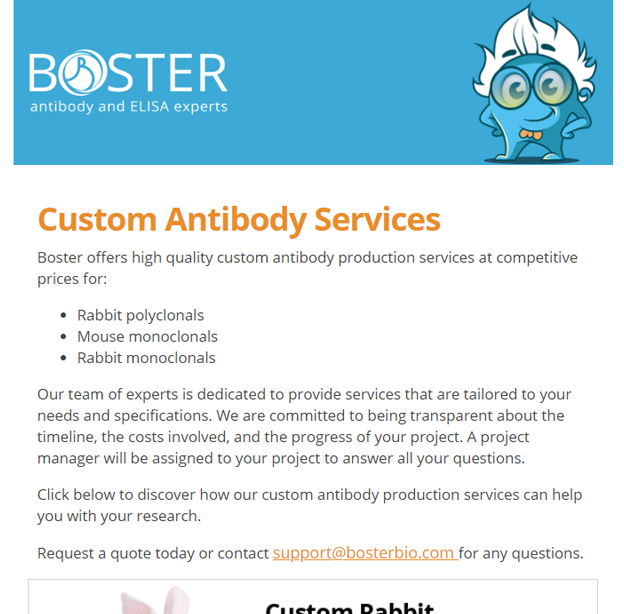 Boster now offers 1300+ rabbit monoclonal antibodies validated for many applications including flow cytometry, IP, IF, IHC, ICC, WB, and ELISAs. 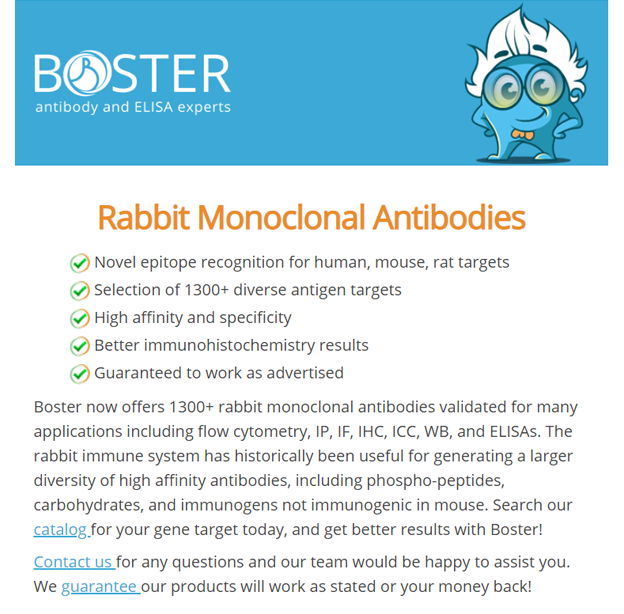 The rabbit immune system has historically been useful for generating a larger diversity of high affinity antibodies, including phospho-peptides, carbohydrates, and immunogens not immunogenic in mouse. 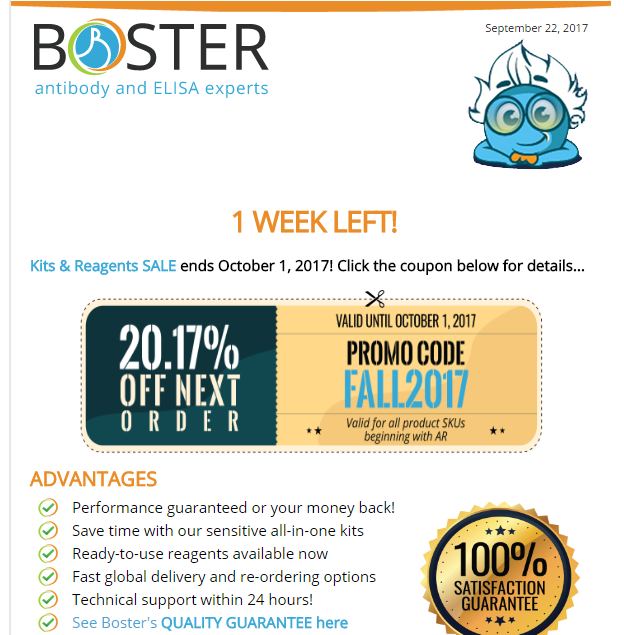 The ELISA (enzyme-linked immunosorbent assay) is recognized by scientists for its many advantages. The assay is convenient, quick, and simple to execute. 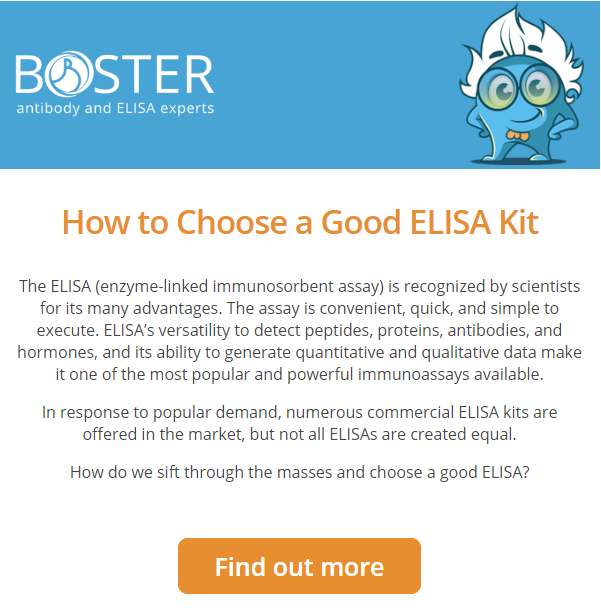 ELISA’s versatility to detect peptides, proteins, antibodies, and hormones, and its ability to generate quantitative and qualitative data make it one of the most popular and powerful immunoassays available. 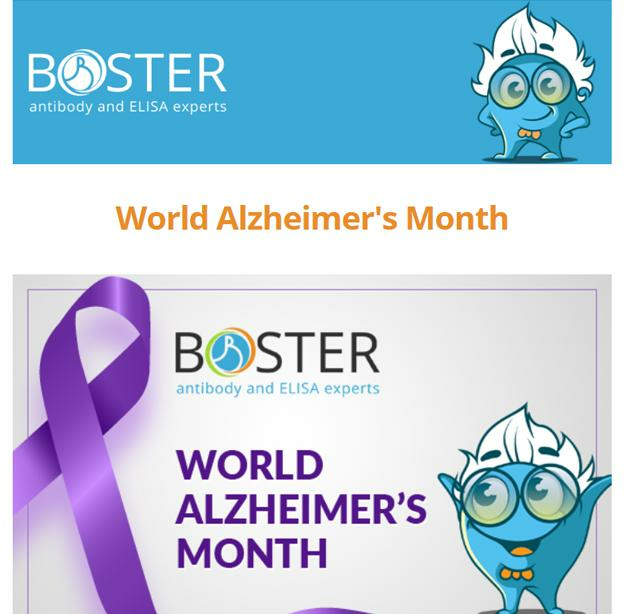 September is World Alzheimer’s Month, an international campaign to raise dementia awareness and challenge stigma, and the purple ribbon is the chosen color to represent awareness for Alzheimer’s disease. The impact of this campaign is growing, but the stigmatization and misinformation that surrounds dementia remains a global issue. 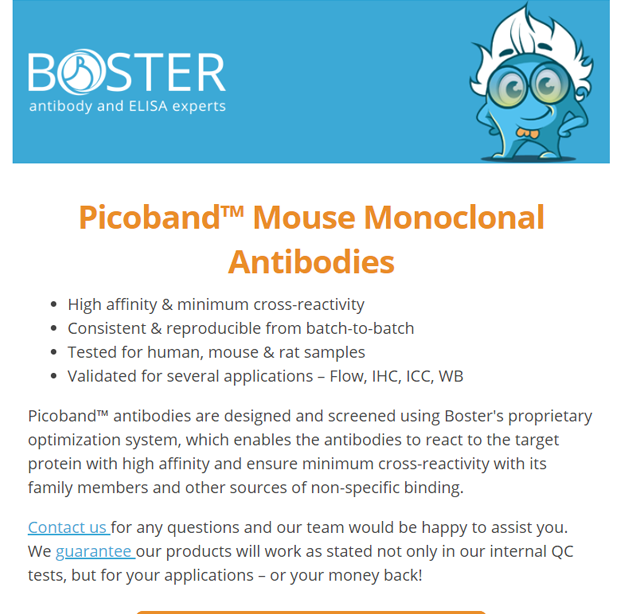 Picoband™ antibodies are designed and screened using Boster's proprietary optimization system, which enables the antibodies to react to the target protein with high affinity and ensure minimum cross-reactivity with its family members and other sources of non-specific binding. 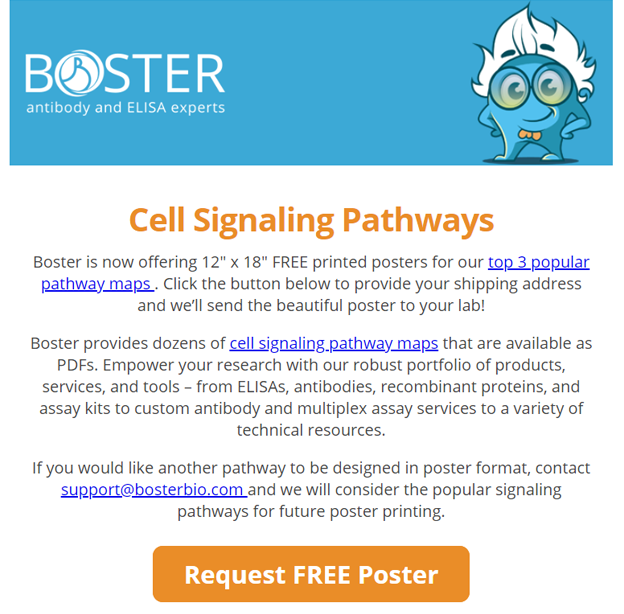 Boster is now offering 12" x 18" FREE printed posters for our top 3 popular pathway maps . Click the button below to provide your shipping address and we’ll send the beautiful poster to your lab! 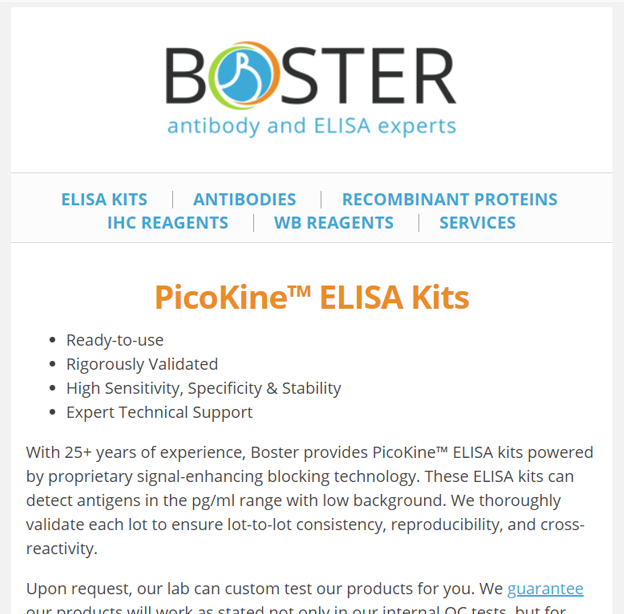 With 25+ years of experience, Boster provides PicoKine™ ELISA kits powered by proprietary signal-enhancing blocking technology. These ELISA kits can detect antigens in the pg/ml range with low background. CTLA4 (cytotoxic T-lymphocyte–associated antigen 4, aka CD152) is a transmembrane protein member of the immunoglobin superfamily. This protein receptor plays a key role in downregulating immune responses (e.g. inhibit T-cell activation). 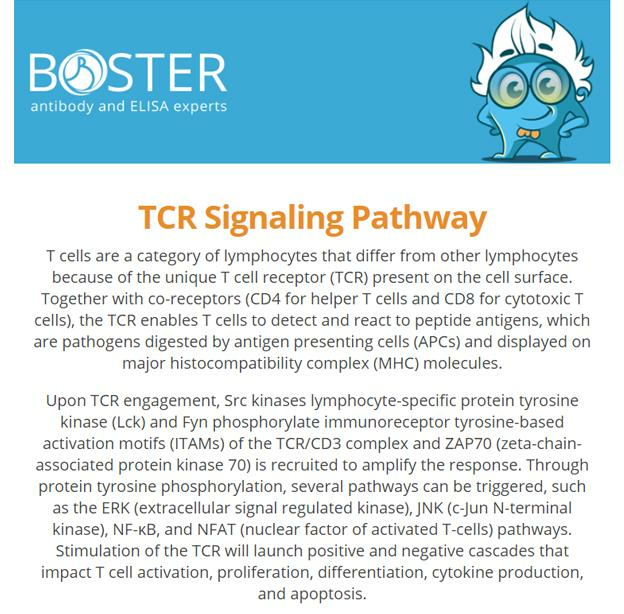 Its expression relies on the stimulation of TCR and the binding between CD28 and B7 (B7-1/CD80 & B7-2/CD86), which both promote T-cell activation. This Saturday, July 28th, is World Hepatitis Day, an annual international awareness event for the over half a billion people globally affected by hepatitis. 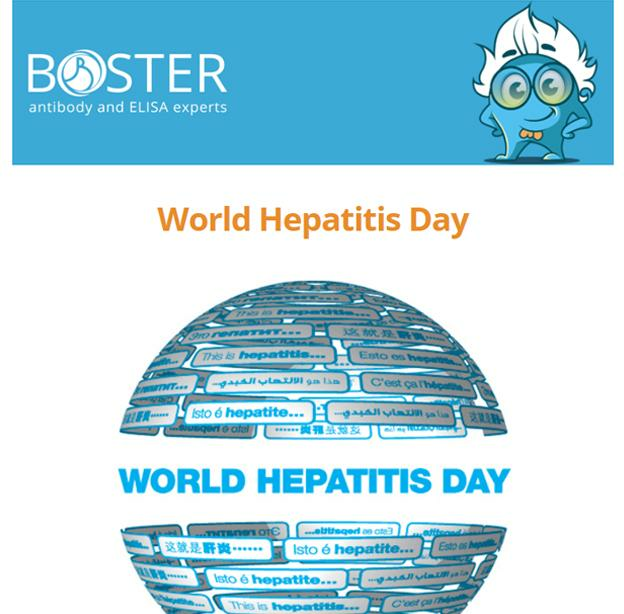 World Hepatitis Day is one of the eight official WHO health days that is supported by many organizations such as the World Hepatitis Alliance, HHS, and CDC. First described in 1979, the technique of western blotting has since become one of the most commonly used analytical methods in life science research. 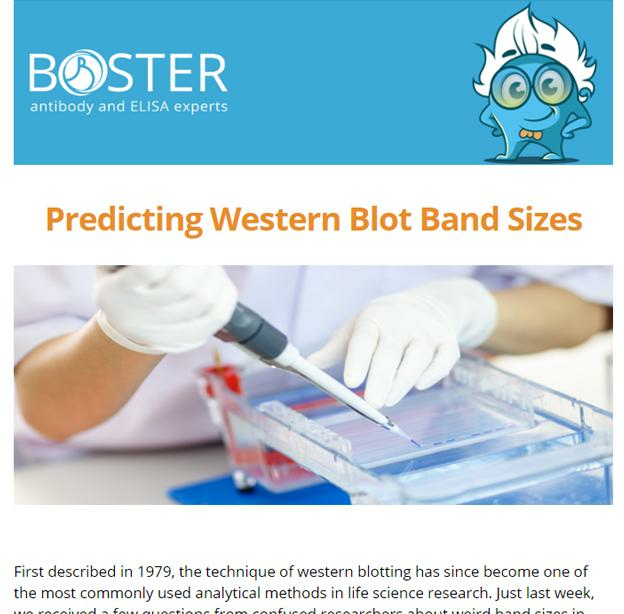 Just last week, we received a few questions from confused researchers about weird band sizes in their western blot results. Our team of experts is dedicated to provide services that are tailored to your needs and specifications. We are committed to being transparent about the timeline, the costs involved, and the progress of your project. A project manager will be assigned to your project to answer all your questions. 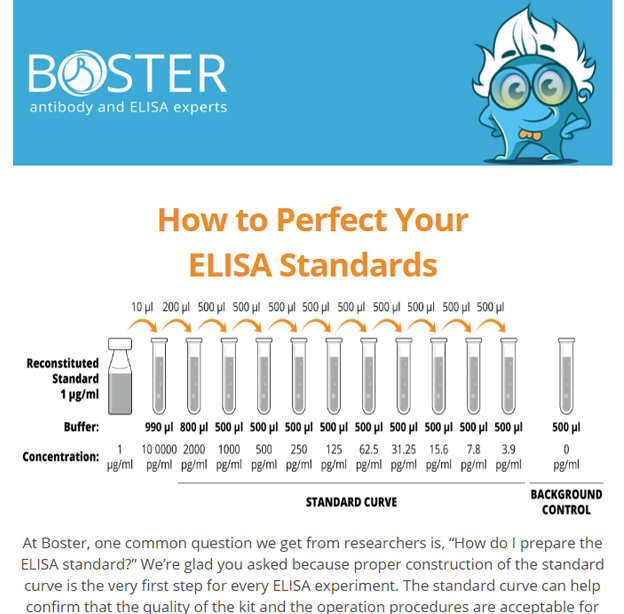 At Boster, one common question we get from researchers is, “How do I prepare the ELISA standard?” We’re glad you asked because proper construction of the standard curve is the very first step for every ELISA experiment. The standard curve can help confirm that the quality of the kit and the operation procedures are acceptable for further steps. 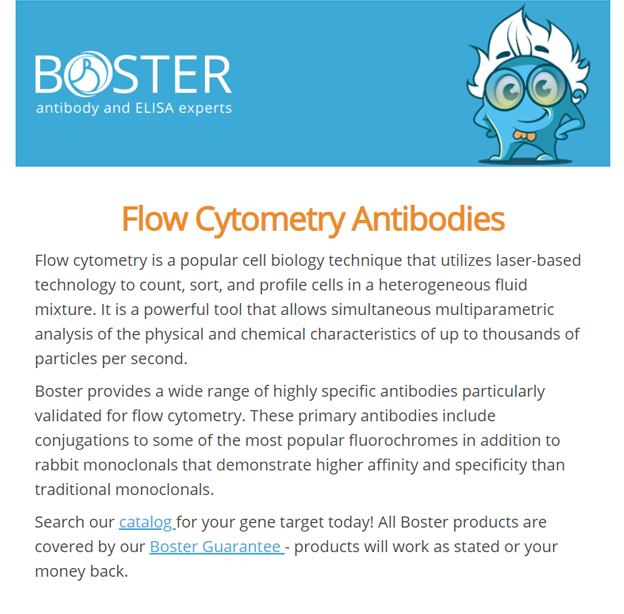 Boster proudly offers a full range of buffers, reagents, and kits for everyday lab use. Save up to 99% compared to leading brands such as Thermo and Sigma, with equivalent product performance. 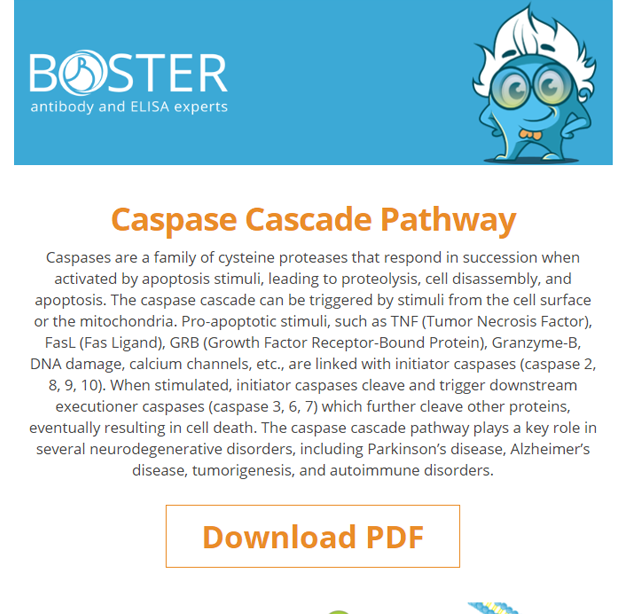 Caspases are a family of cysteine proteases that respond in succession when activated by apoptosis stimuli, leading to proteolysis, cell disassembly, and apoptosis. The caspase cascade can be triggered by stimuli from the cell surface or the mitochondria. Pro-apoptotic stimuli, such as TNF (Tumor Necrosis Factor), FasL (Fas Ligand), GRB (Growth Factor Receptor-Bound Protein), Granzyme-B, DNA damage, calcium channels, etc. 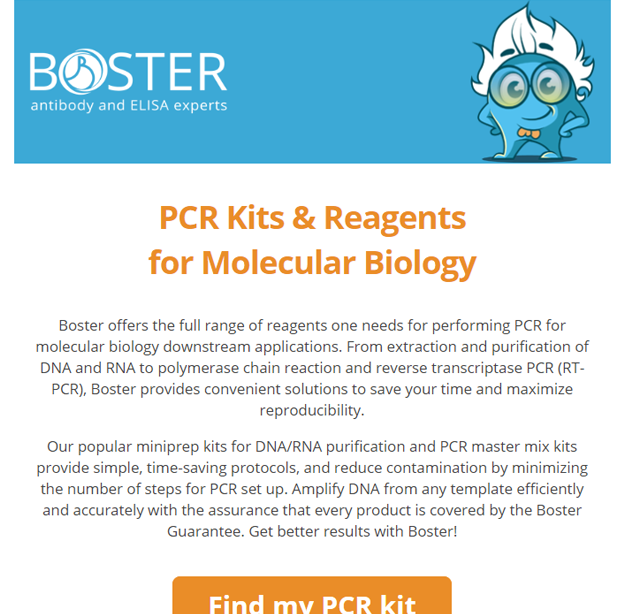 Boster offers the full range of reagents one needs for performing PCR for molecular biology downstream applications. From extraction and purification of DNA and RNA to polymerase chain reaction and reverse transcriptase PCR (RT-PCR), Boster provides convenient solutions to save your time and maximize reproducibility. 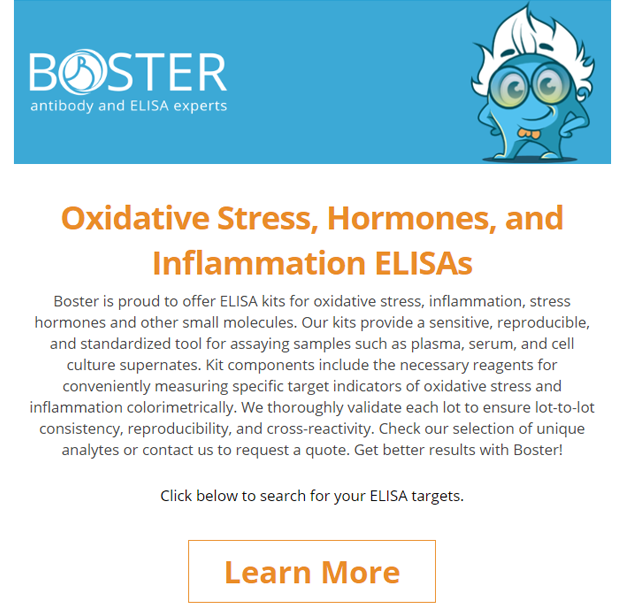 Boster is proud to offer ELISA kits for oxidative stress, inflammation, stress hormones and other small molecules. Our kits provide a sensitive, reproducible, and standardized tool for assaying samples such as plasma, serum, and cell culture supernates. Kit components include the necessary reagents for conveniently measuring specific target indicators of oxidative stress and inflammation colorimetrically. 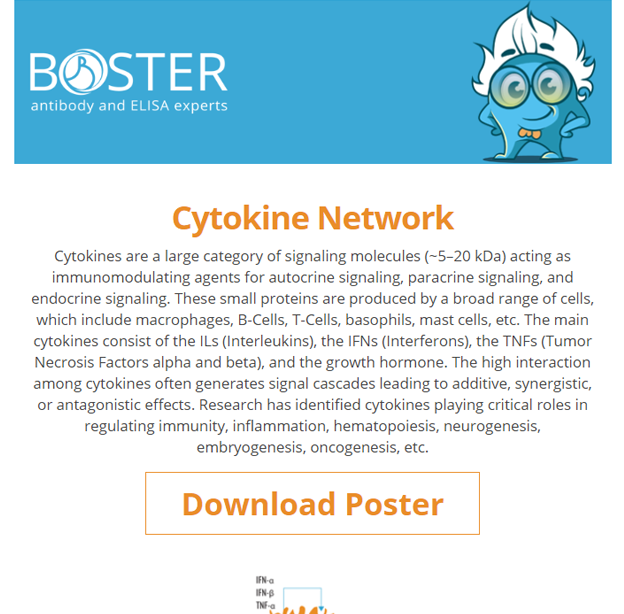 Cytokines are a large category of signaling molecules (~5–20 kDa) acting as immunomodulating agents for autocrine signaling, paracrine signaling, and endocrine signaling. These small proteins are produced by a broad range of cells, which include macrophages, B-Cells, T-Cells, basophils, mast cells, etc. We’re always trying to better manage our lab budget. 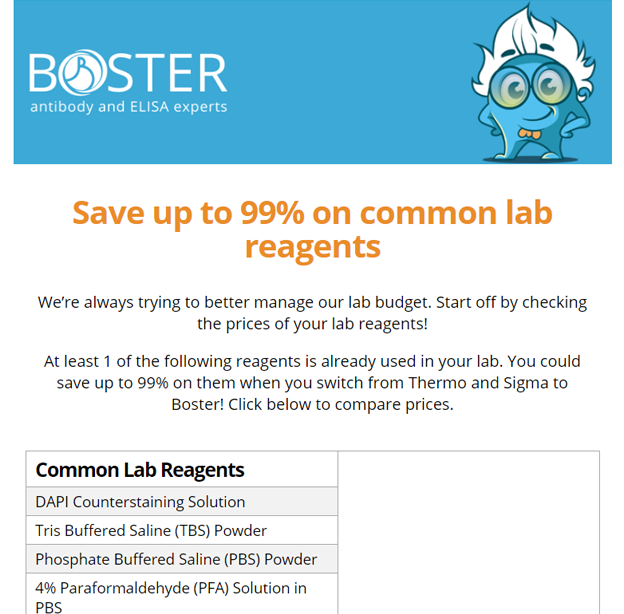 Start off by checking the prices of your lab reagents! At least 1 of the following reagents is already used in your lab. 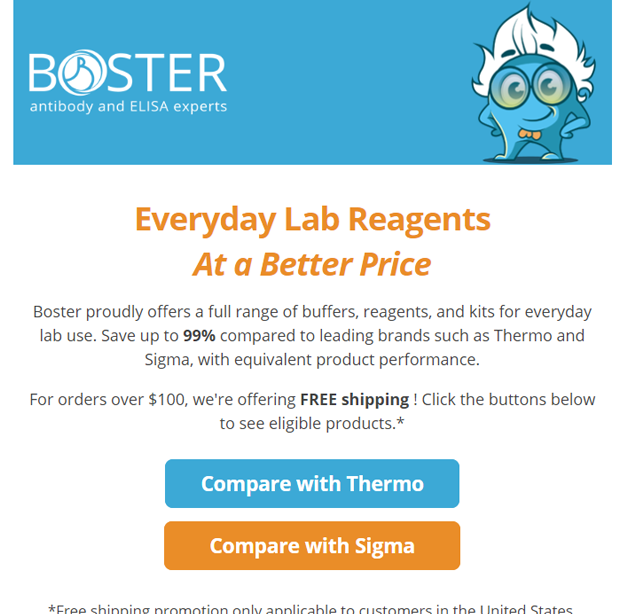 You could save up to 99% on them when you switch from Thermo and Sigma to Boster! 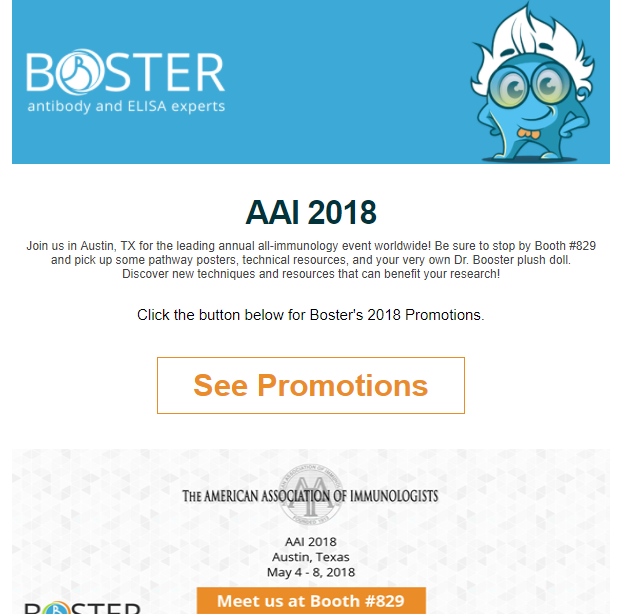 Join us in Austin, TX for the leading annual all-immunology event worldwide! Be sure to stop by Booth #829 and pick up some pathway posters, technical resources, and your very own Dr. Booster plush doll. Discover new techniques and resources that can benefit your research! 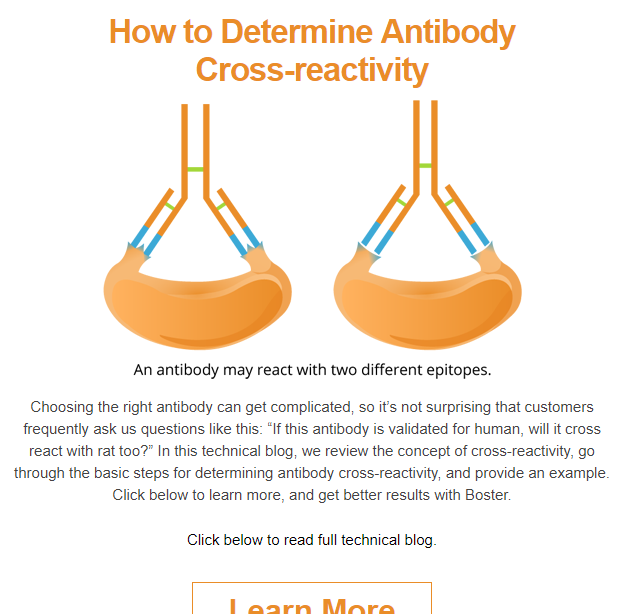 Choosing the right antibody can get complicated, so it’s not surprising that customers frequently ask us questions like this: “If this antibody is validated for human, will it cross react with rat too?” In this technical blog, we review the concept of cross-reactivity, go through the basic steps for determining antibody cross-reactivity, and provide an example. Read on to learn more. 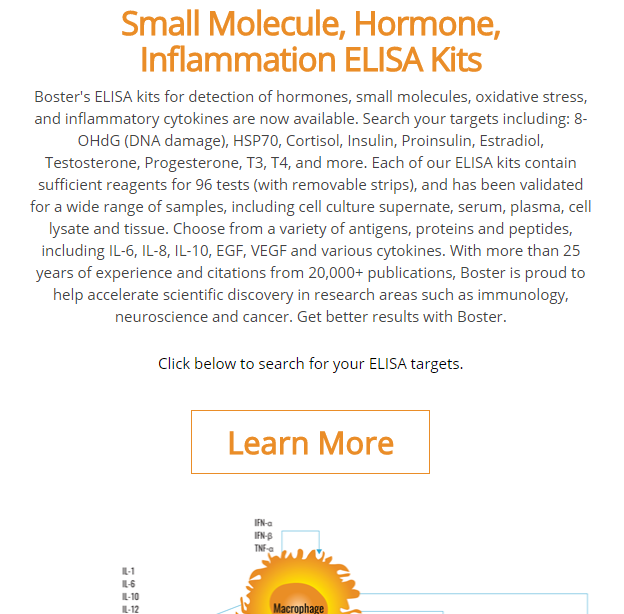 Boster's ELISA kits for detection of hormones, small molecules, oxidative stress, and inflammatory cytokines are now available. Search your targets including: 8-OHdG (DNA damage), HSP70, Cortisol, Insulin, Proinsulin, Estradiol, Testosterone, Progesterone, T3, T4, and more. Each of our ELISA kits contain sufficient reagents for 96 tests (with removable strips), and has been validated for a wide range of samples, including cell culture supernate, serum, plasma, cell lysate and tissue. Choose from a variety of antigens, proteins and peptides, including IL-6, IL-8, IL-10, EGF, VEGF and various cytokines. 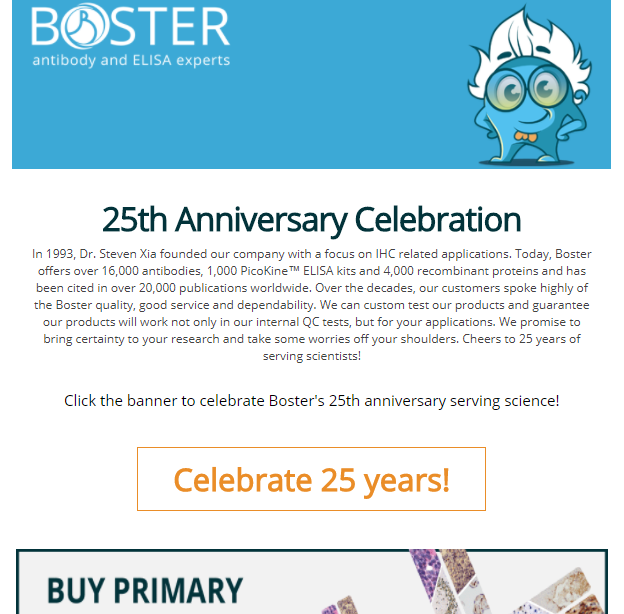 With more than 25 years of experience and citations from 20,000+ publications, Boster is proud to help accelerate scientific discovery in research areas such as immunology, neuroscience and cancer. 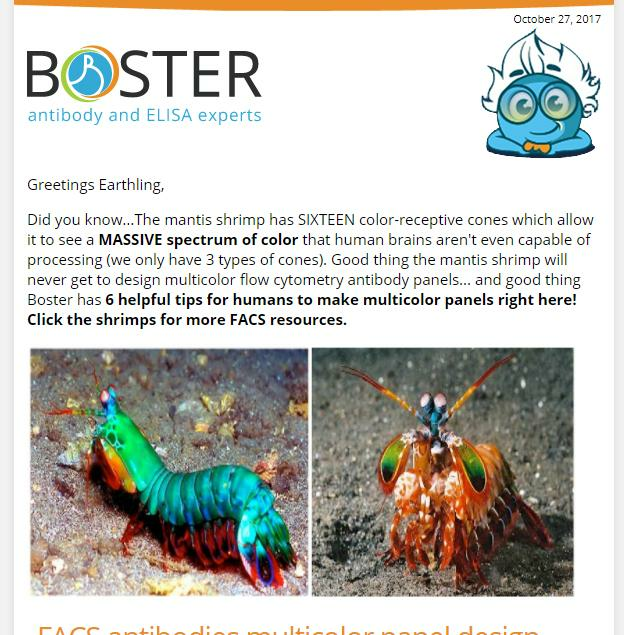 Get better results with Boster. In normal conditions, mutated antigens from tumor cells will lead to the activation of T cells that bind to and trigger apoptosis in target cancer cells. On the surface of T cells are PD-1 (programmed cell death-1) receptors whose ligands include PD-L1 and PD-L2. Together, PD-1 and PD-L1/PD-L2 are involved with inhibiting T cell response so that the immune response is only initiated when necessary, avoiding chronic autoimmune inflammation. However, tumor cells have utilized the PD-1/PD-L1 pathway to resist anticancer immune responses by producing abnormally high levels of PD-L1. When the PD-L1 ligands bind to the PD-1 receptors on T cells, the T cells become deactivated and anti-tumor activity is obstructed. 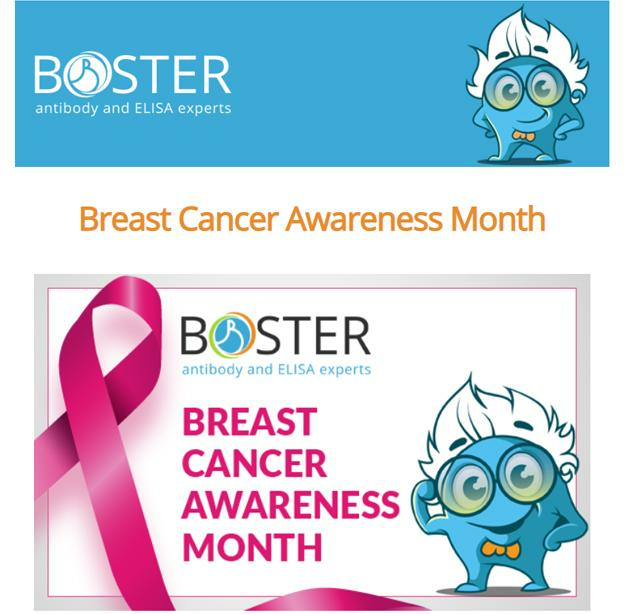 Boster Bio will be attending 2 exciting events this month! 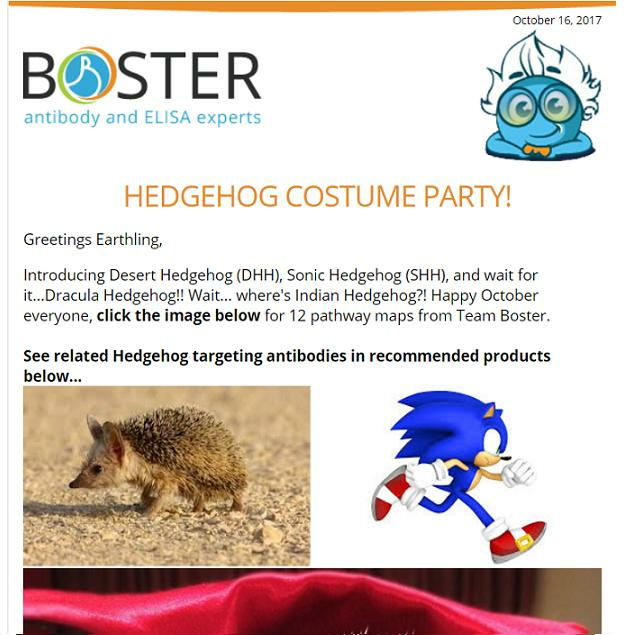 Be sure to visit our booths to meet Team Boster and take home our cuddly mascot, Dr. Booster. First up is the AACR Annual Meeting in Chicago from April 14-18. 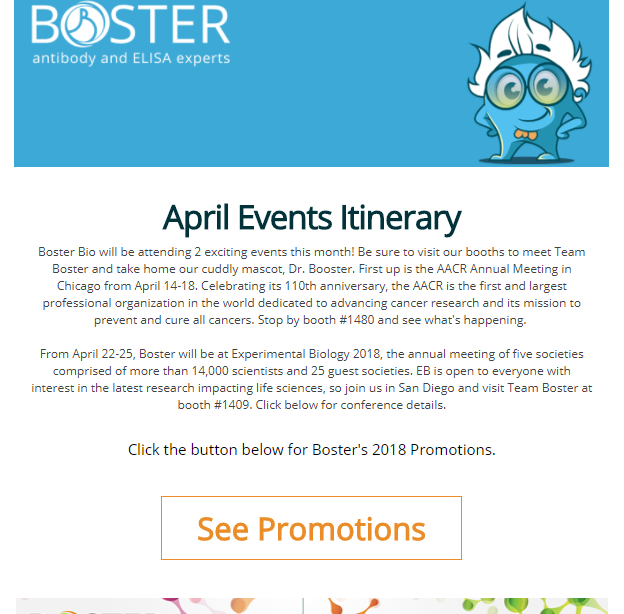 Then from April 22-25, Boster will be at Experimental Biology 2018, the annual meeting of five societies comprised of more than 14,000 scientists and 25 guest societies. Learn more about these 2 impactful yearly gatherings. 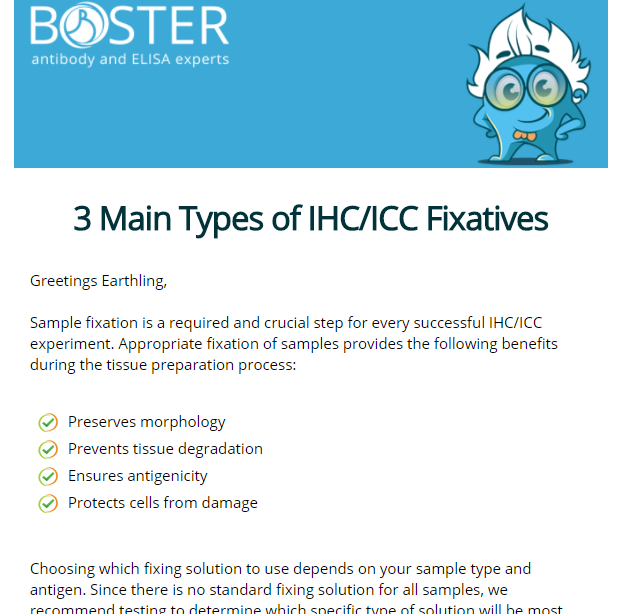 Sample fixation is a required and crucial step for every successful IHC/ICC experiment. Choosing which fixing solution to use depends on your sample type and antigen. Since there is no standard fixing solution for all samples, we recommend testing to determine which specific type of solution will be most appropriate and effective for antigen immobilization in your sample. Read on to learn more about IHC and ICC fixation. In 1993, Dr. Steven Xia founded our company with a focus on IHC related applications. 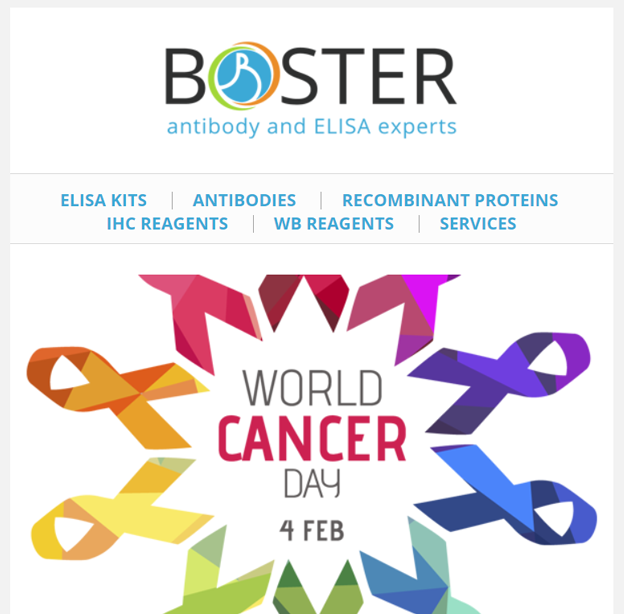 Today, Boster offers over 16,000 antibodies, 1,000 PicoKine™ ELISA kits and 4,000 recombinant proteins and has been cited in over 20,000 publications worldwide. Over the decades, our customers spoke highly of the Boster quality, good service and dependability. We can custom test our products and guarantee our products will work not only in our internal QC tests, but for your applications. We promise to bring certainty to your research and take some worries off your shoulders. Cheers to 25 years of serving scientists! Cancer stem cells (CSCs), also known as tumor-initiating cells (TICs), are a subpopulation of cancer cells that possess the self-renewal and multi/pluripotency properties similar to that of normal stem cells. They have been identified to be tumorigenic and linked with inducing metastasis. Several molecular signaling pathways are associated with governing stem cell homeostasis. Normally, these pathways are highly regulated. However, an increasing number of these signaling pathways have been discovered to become dysfunctional in CSCs, which include the JAK/STAT, Hedgehog, Wnt, Notch, NF-κB, PI3K and PTEN signaling pathways. In certain cases, cross-talk between different pathways contribute to CSC population maintenance. Download the pathway map poster to learn more. Taking place in San Antonio, Texas, March 11–15, 2018, the SOT Annual Meeting will feature 2,000+ presenters and 170 Scientific Sessions. Over 6,500 attendees are anticipated for the event! Join us in creating a safer and healthier world by advancing the science of toxicology. Try our fun quiz to win a prize! To set up a standard curve, ELISA standards should be carefully prepared for accurate sample quantification of the target protein. 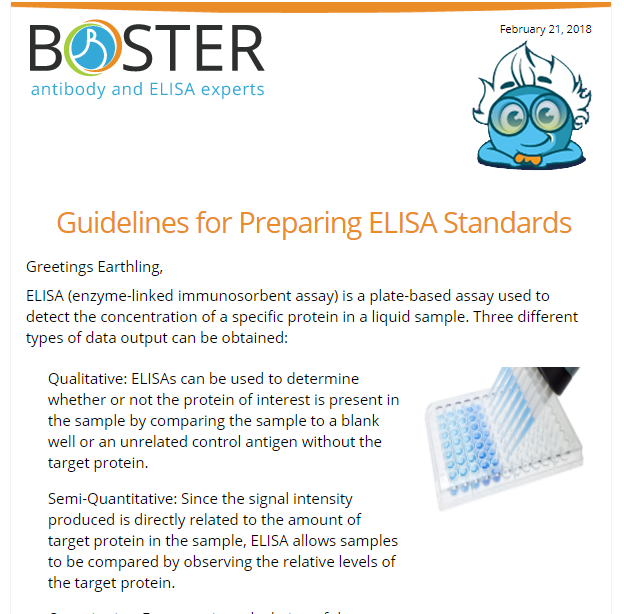 We’ve provided some guidelines for you to consider when preparing ELISA standards. In this technical blog, you will learn what kind of standard you should choose, what the standard curve range should typically be, and how to properly prepare the standard dilutions. Happy Valentine's and Chinese New Year! 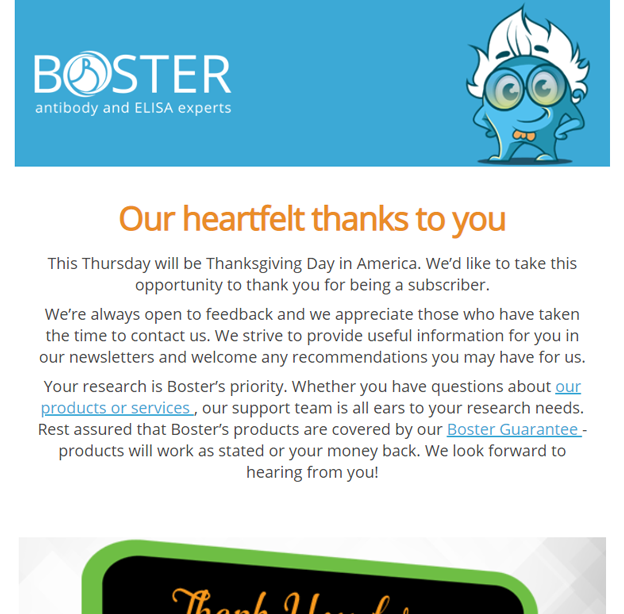 Boster Bio wishes everyone great fortune and continued success. Remember to check out our 2018 promotions! Apoptosis (aka programmed cell death) is a cell suicide mechanism that is activated through the mitochondria due to cell stress (intrinsic pathway) or initiated via death receptors that sense extracellular death signals through ligand binding (extrinsic pathway). 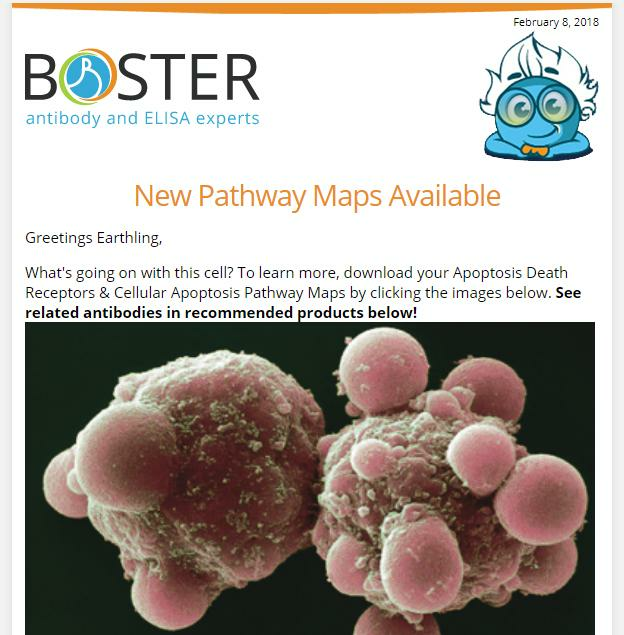 Click to learn more and download your Apoptosis Death Receptors & Cellular Apoptosis Pathway Maps. In the lab, researchers invest time and effort to optimize the sample preparation and sample staining processes of IHC. When successful, the results produce a strong and specific signal. However, how do we know the results have been interpreted correctly? When designing your IHC experiment, it is crucial to include positive and negative controls. The controls will help verify whether or not the IHC staining results observed are accurate and valid while exposing experimental artefacts. 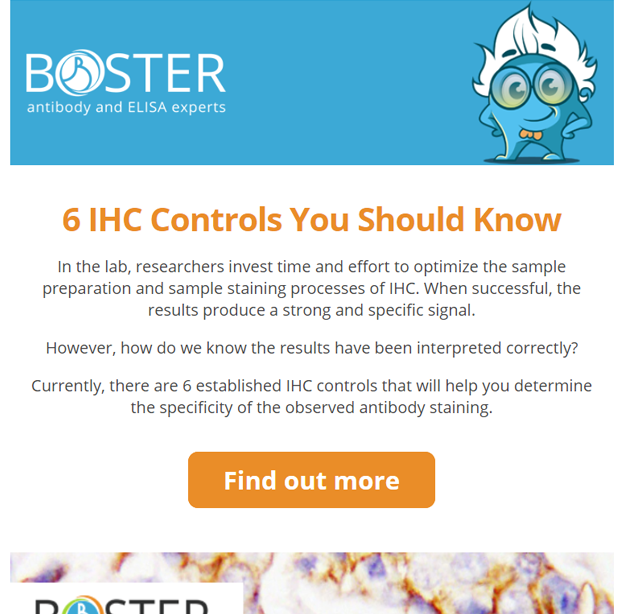 Read on to find out the 6 established controls for IHC! 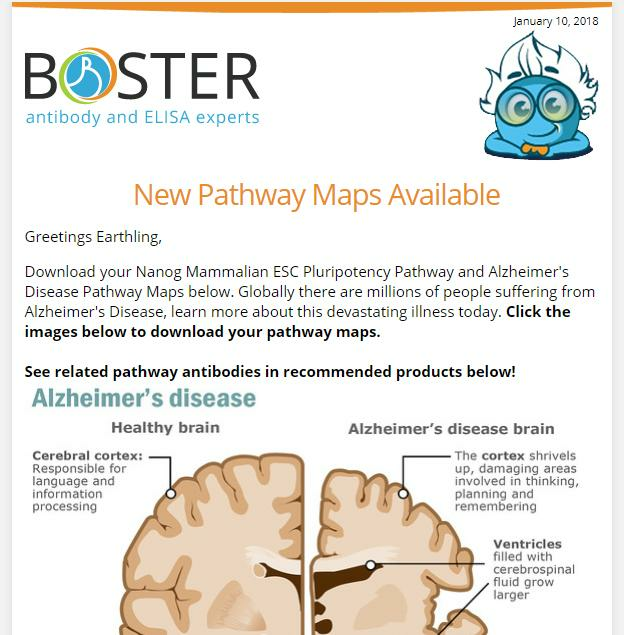 Check out this week’s newsletter to download your Nanog Mammalian ESC Pluripotency Pathway and Alzheimer's Disease Pathway Maps. Globally, there are millions of people suffering from Alzheimer's Disease. Learn more about this devastating illness today. 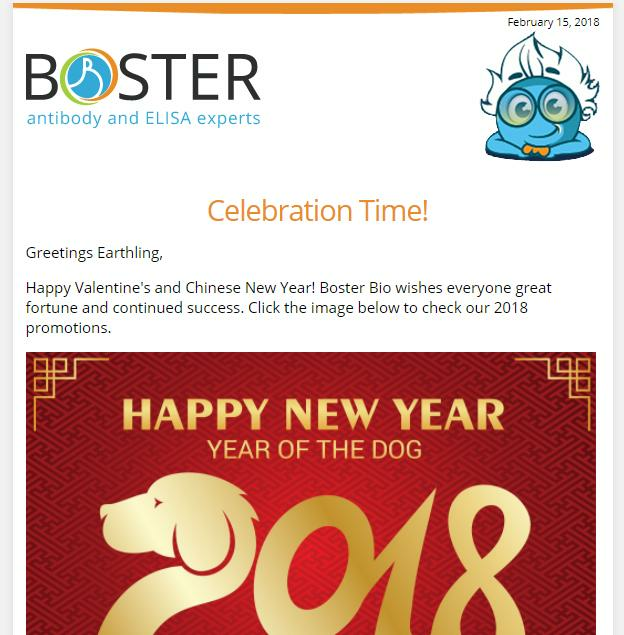 Happy New Year from Boster! 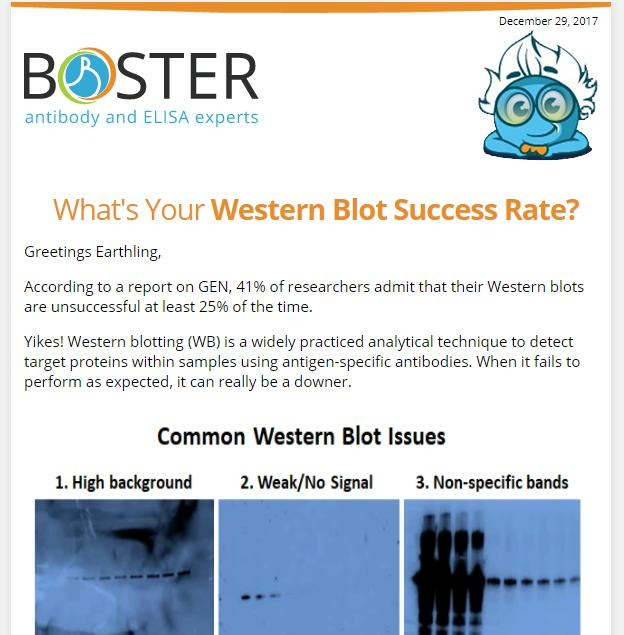 What’s your Western blot success rate? According to a report on GEN, 41% of researchers admit that their Western blots are unsuccessful at least 25% of the time. We’re here to help you succeed. 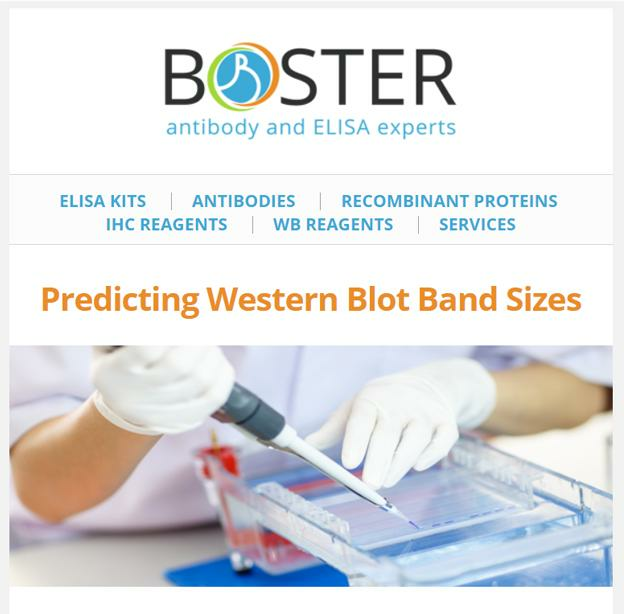 Next time you encounter another problem with Western blot, we’ve compiled a checklist to help you troubleshoot your experiment. 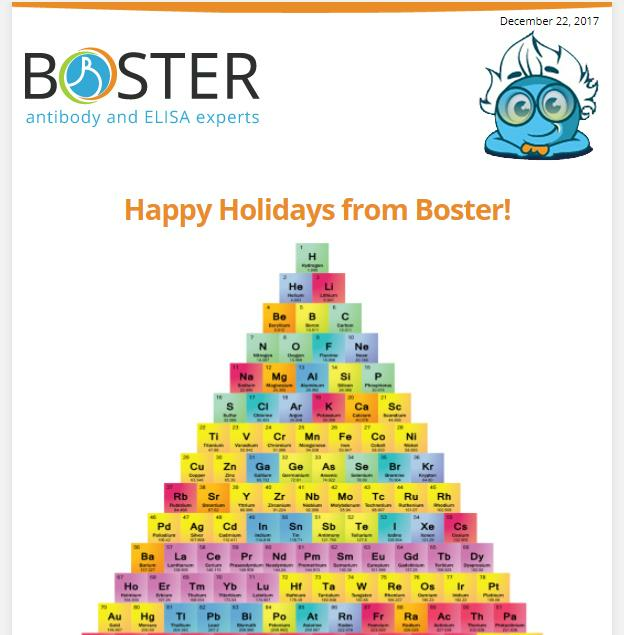 Happy Holidays from Boster Bio! 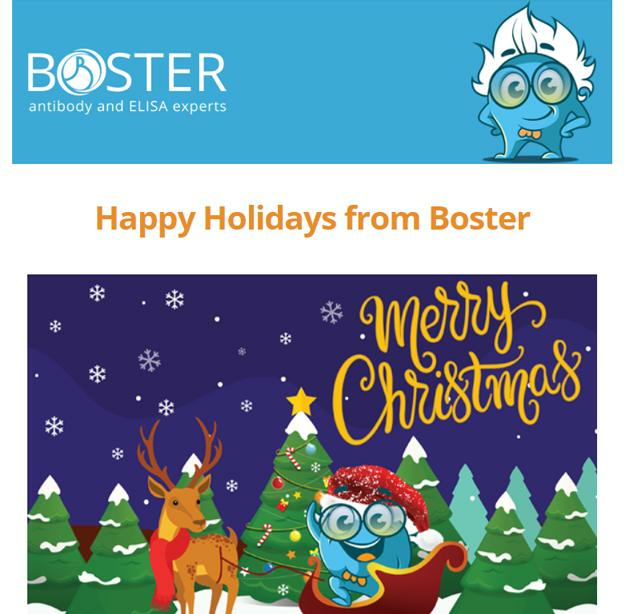 Team Boster wishes you happy holidays and continued success for the new year. Keep checking our promotions page for sweet deals in 2018 and get better results with Boster! 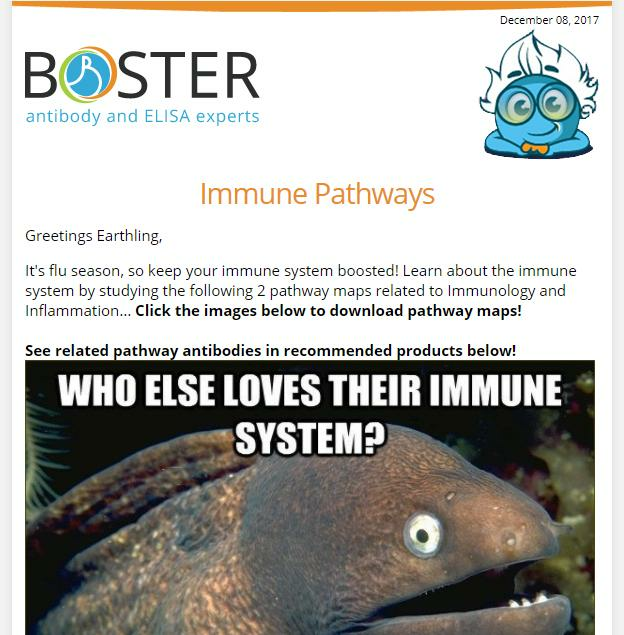 Who loves their immune system? It's flu season, so keep your immune system boosted! Learn about the immune system by studying 2 pathway maps related to Immunology and Inflammation - the Toll-Like Receptors Pathway and the NF-KappaB p50-p65 Pathway. ELISA is a convenient and simple method to quantitatively or qualitatively detect peptides, proteins, antibodies, and hormones in samples, rendering it as one of the most widely used immunoassays. Despite the many advantages of conducting ELISA, there are some mistakes that could quickly turn your ELISA experiment sour. 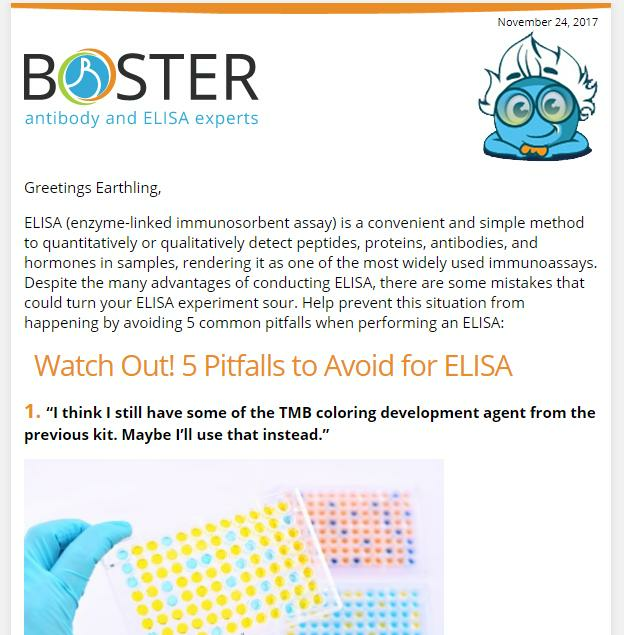 Read about the 5 common pitfalls to avoid when performing an ELISA so that you can prevent this situation from happening! 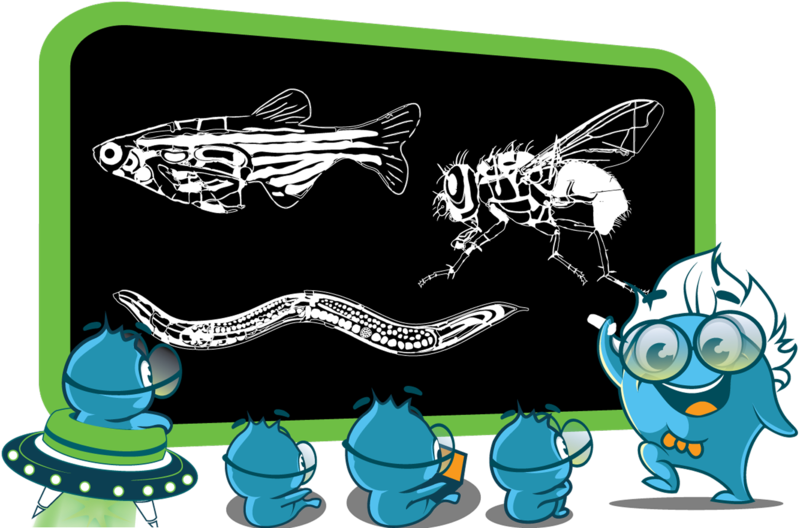 ASCB 2017 Cell Biology Conference is in Philadelphia this December 2-6! Join scientists around the globe to explore cell structure and function this winter! 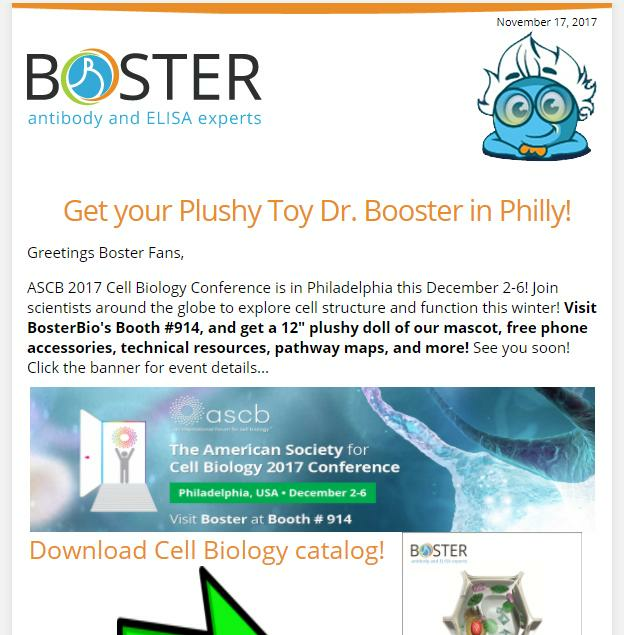 Visit BosterBio's Booth #914, and get a 12" plushy doll of our mascot, free phone accessories, technical resources, pathway maps, and more! See you soon! Cytomegalovirus (CMV) is capable of triggering several pathways. In particular, CMV stimulates the MAPK pathway to initiate cellular processes related to transcriptional regulation. 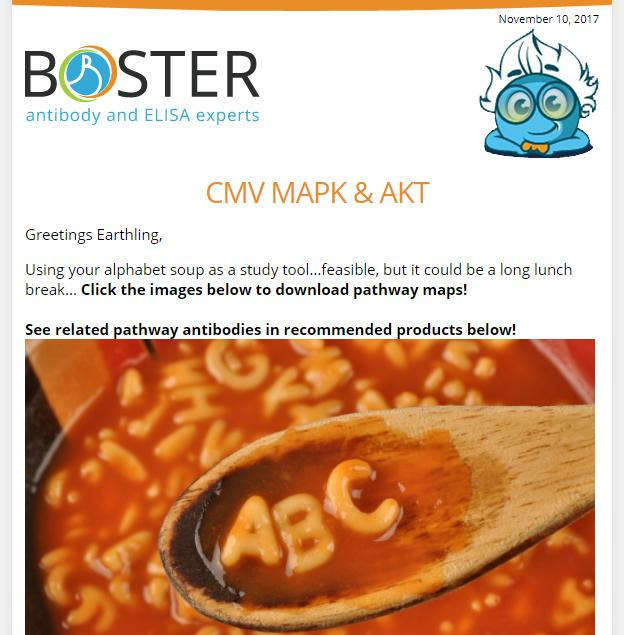 Another pathway CMV can activate is the Akt/PKB pathway, which promotes cell survival, growth, and proliferation. 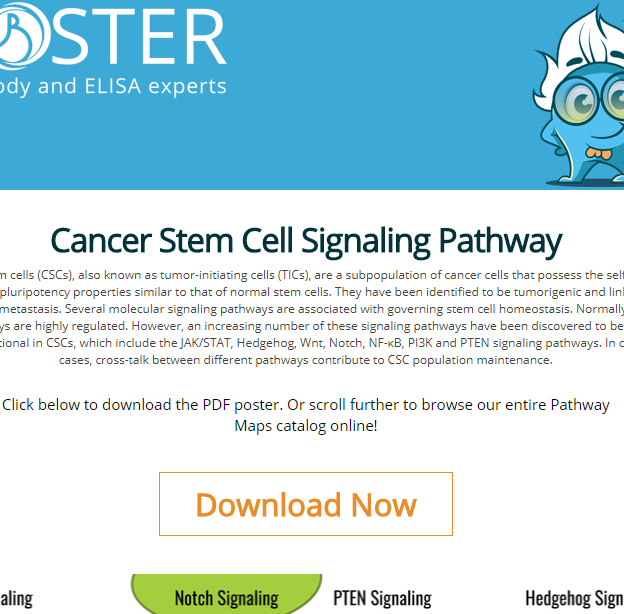 Click to read more about the signaling pathways & download the pathway maps! Planning to design multicolor panels for FACS antibodies? 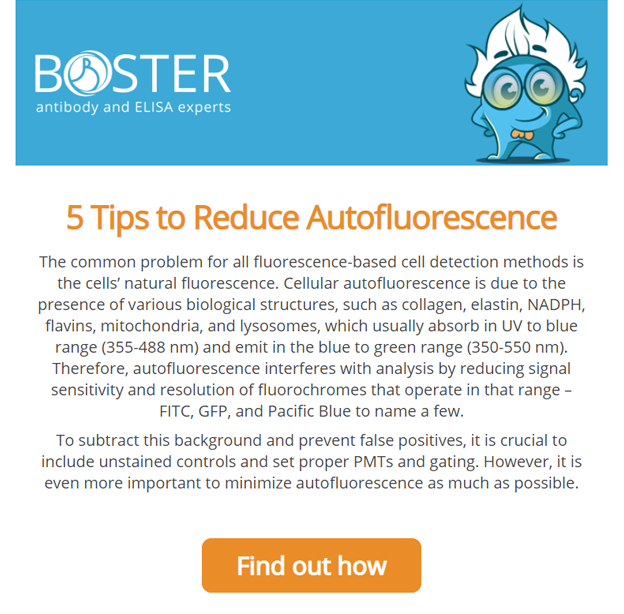 Boster presents 6 helpful tips to keep in mind when designing multicolor flow cytometry panels! Don’t miss the FACS resources and recommendations we’ve compiled in this newsletter! Neuroscience 2017 is November 11-15 at the Walter E. Washington Convention Center. Join 30,000+ colleagues from over 80 countries at the world’s largest conference for global neuroscience. 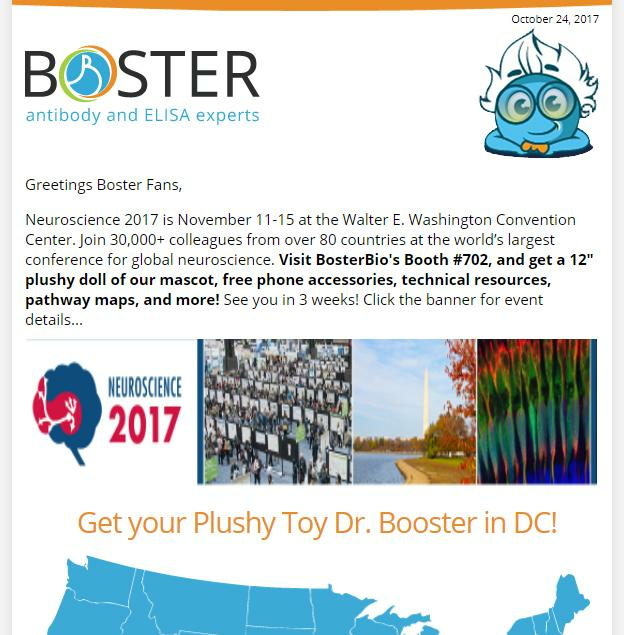 Visit Boster Bio's Booth #702, and get a 12" plushy doll of our mascot, free phone accessories, technical resources, pathway maps, and more! See you in 3 weeks! Introducing Desert Hedgehog (DHH), Sonic Hedgehog (SHH), and wait for it...Dracula Hedgehog!! All jokes aside, we’re focusing on 2 signaling pathways this week - the Hedgehog Signaling Pathway & the DNA Methylation and Transcriptional Repression Pathway. 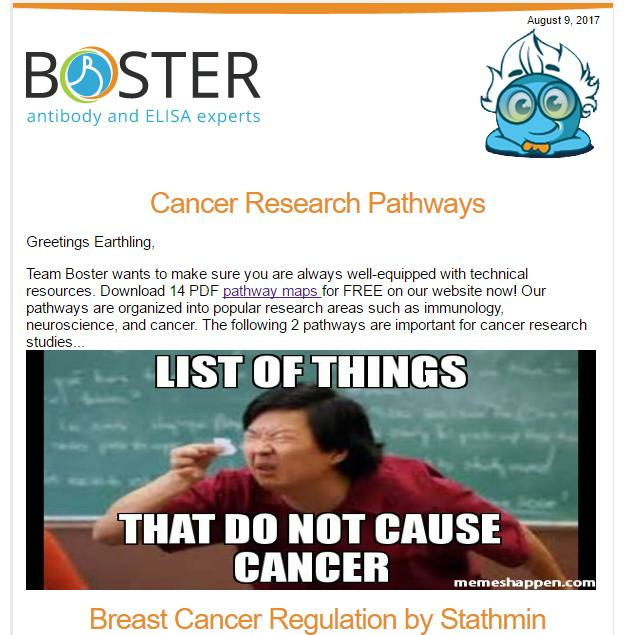 For more information, read this newsletter & download these 2 pathways now! There are 3 situations when an FMO control is highly recommended! The Fluorescence Minus One (FMO controls) are staining controls that contain all the antibodies of a panel minus 1 of them. It measures the spillover of all those other fluorophores in the channel of the missing antibody, and is used to identify and gate cells in the context of data spread due to the multiple fluorophores. It is a stronger negative control than the regular unstained control as it takes into account how the other stains in the panel impact the channel that is left out. Read on for technical tips and tricks when it comes to flow cytometry (FACS). 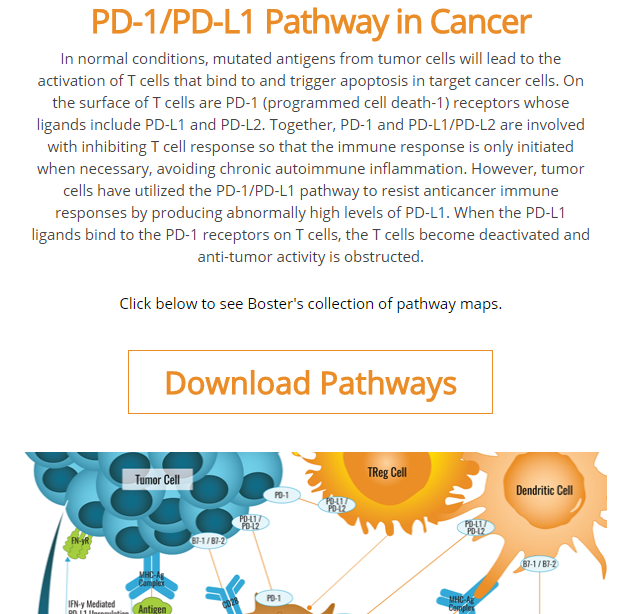 Download 2 Immunology Pathway PDFs Here! Immunology is a complex and thoroughly researched topic today. 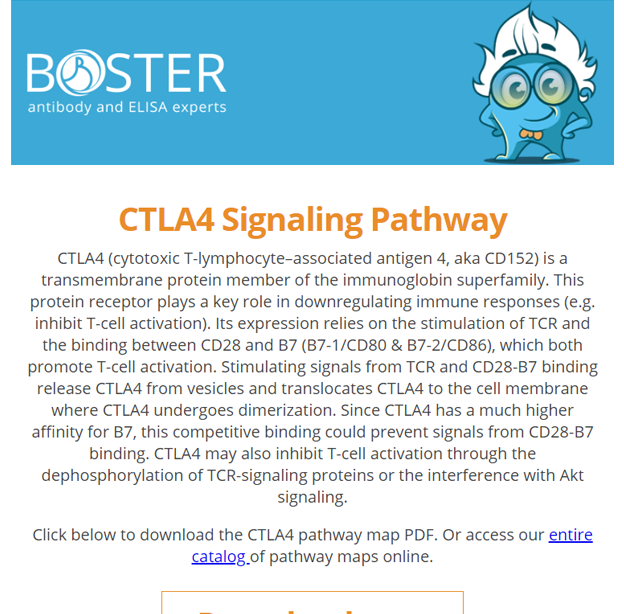 Download your PDF study guides for IL-6 Receptor Pathway and IL-18 Signaling Pathway to reference at your convenience. The pathogenesis of many autoimmune diseases, multiple myeloma, and even prostate cancer are affected by the functions of IL6 and IL6R. Meanwhile, IL-18 is a proinflammatory cytokine which works with IL-12 to induce cell-mediated immunity following infection. IL-18 is able to induce severe inflammatory responses, suggesting it plays a role in various inflammatory disorders. Get your immunology posters, formatted in 8.5x11 inch (letter size). Do you Western Blot? Utilize our summary workflow for a standard Western Blot protocol, with necessary reagents for each step included! Following protein transfer, it is important to block the unreacted sites on the membrane using inert proteins and/or nonionic detergent to reduce levels of nonspecific protein binding during the assay. Blocking buffers should block all unreacted sites without disrupting target protein-membrane interactions or affect epitope availability. 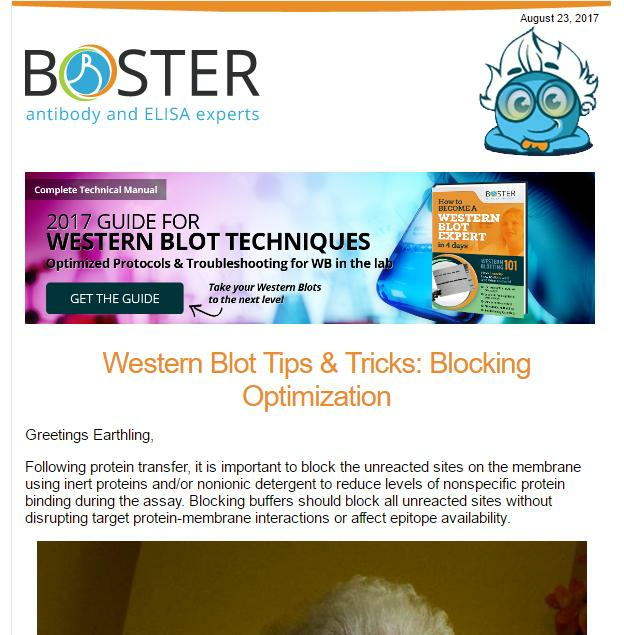 In this newsletter, learn the 3 key factors to consider when choosing an appropriate blocking agent for your specific Western Blot experiment! Stathmin is essential for the regulation of the cell cytoskeleton, which is required for numerous cell processes including regulating the cell cycle, cytoplasmic organization, cell division and cell motility. WNT signaling has been identified for its role in carcinogenesis, in maintaining stem cells, and its function in embryonic development. Three WNT signaling pathways have been identified. If you are performing IHC experiments, you may need to optimize your antigen retrieval methods. Techniques generally fall into two main categories: protease-induced epitope retrieval (PIER) and heat-induced epitope retrieval (HIER). In general, HIER has a much higher success rate and is recommended over PIER methods. 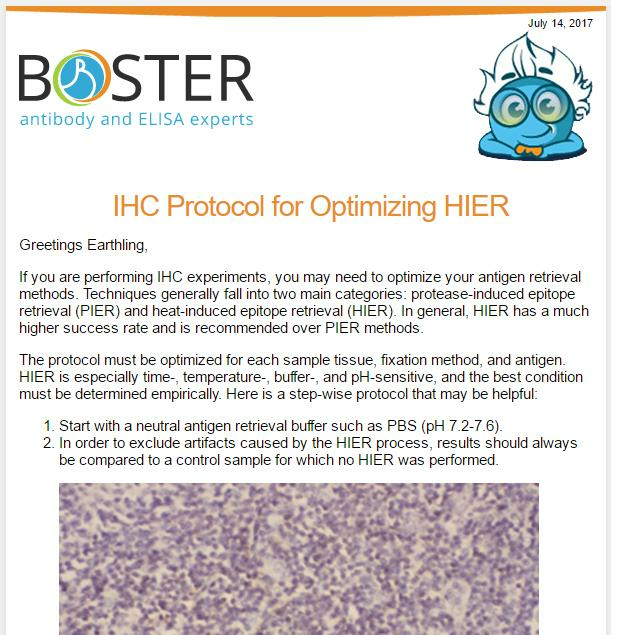 The protocol for HIER must be optimized for each sample tissue, fixation method, and antigen. This method is especially time-, temperature-, buffer-, and pH-sensitive, and the best condition must be determined empirically. Here is a step-wise protocol that may be helpful for your immunohistochemistry experiment. Counting cells before the staining procedure and the analysis/live sort is not up for debate! Cell numbers affect the staining quality, the FACS instrument reading, as well as the efficacy of any downstream assay, in case the cells are live sorted. Furthermore, cells are steadily lost during the staining procedure and it is therefore imperative that enough cells are available at the start of the experiment to compensate for the inevitable losses. 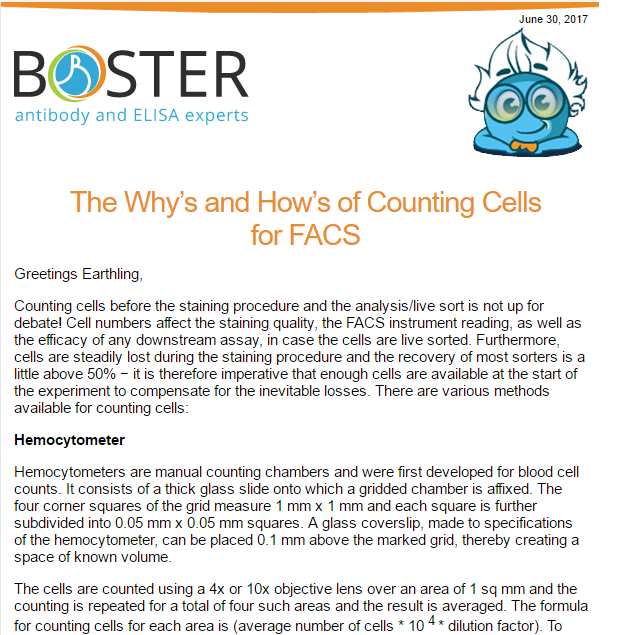 There are various methods available for counting cells which are explained in this technical newsletter. Optimizing your ELISA immunoassay can be a long and tedious process. 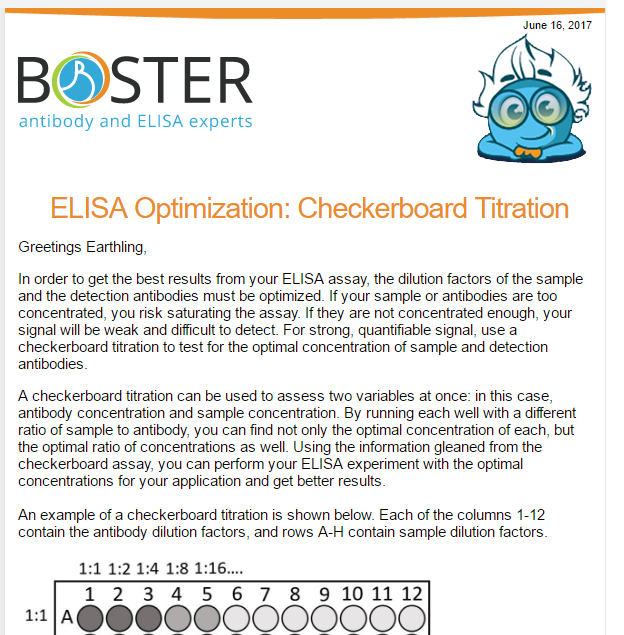 Fortunately, using checkboard titration could help you optimize your ELISA assay more quickly, efficiently, and accurately. Here is a how-to-guide for utilizing this method in your next ELISA protocol. Antigen retrieval is often necessary when performing IHC experiments. 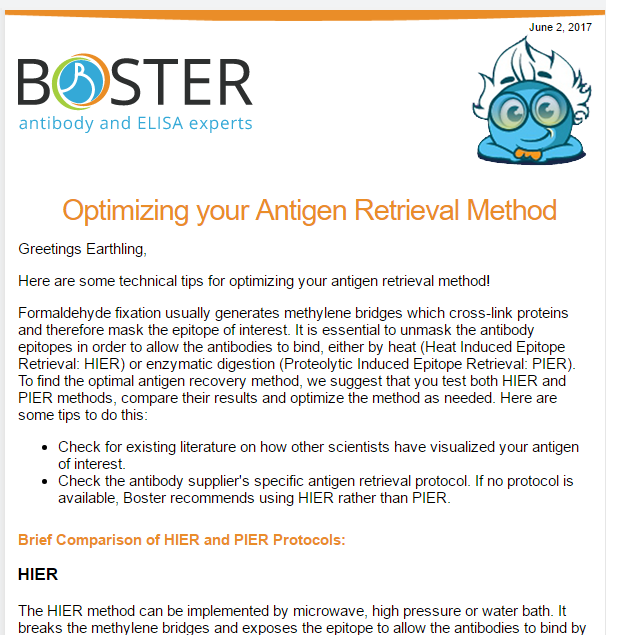 Here are some key points to know about HIER and PIER methods of antigen retrieval. This protocol step needs to be optimized for every antigen of interest. 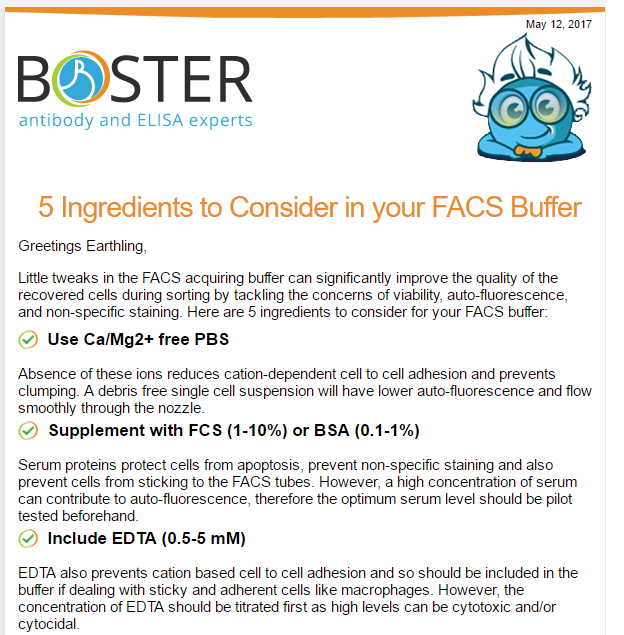 If you perform flow cytometry, these recipe tips for FACS Buffers may assist you! We recommend these ingredients to improve your cell sorting process. 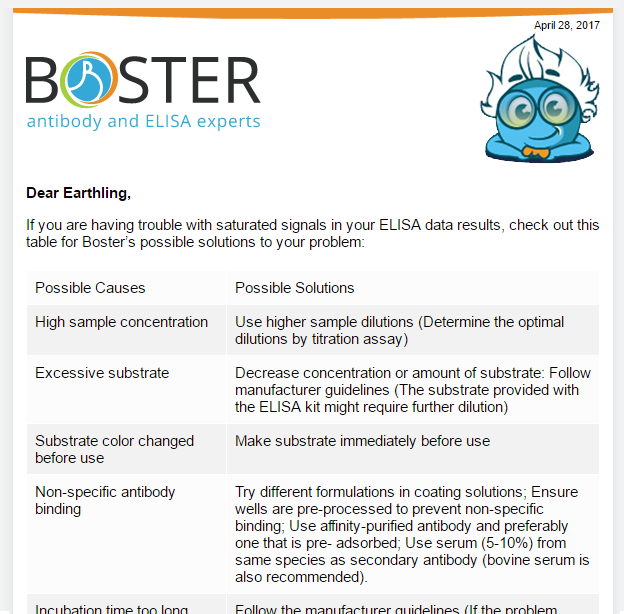 Every ELISA kit user comes across the need to troubleshoot their assay at some point. Saturated signals can result from many different possible causes, and this could make troubleshooting complicated. Dr. 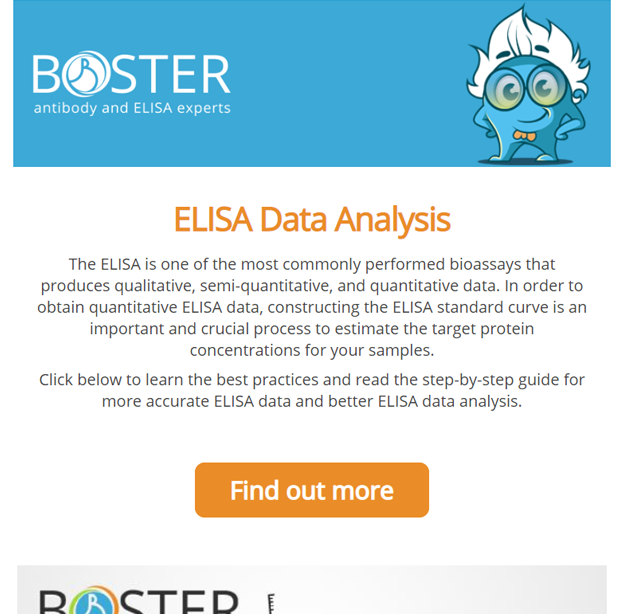 Booster has come up with a table of recommended solutions for troubleshooting your ELISA assay. If this table does not help your specific experiment, please feel free to contact Boster's technical support at any time. 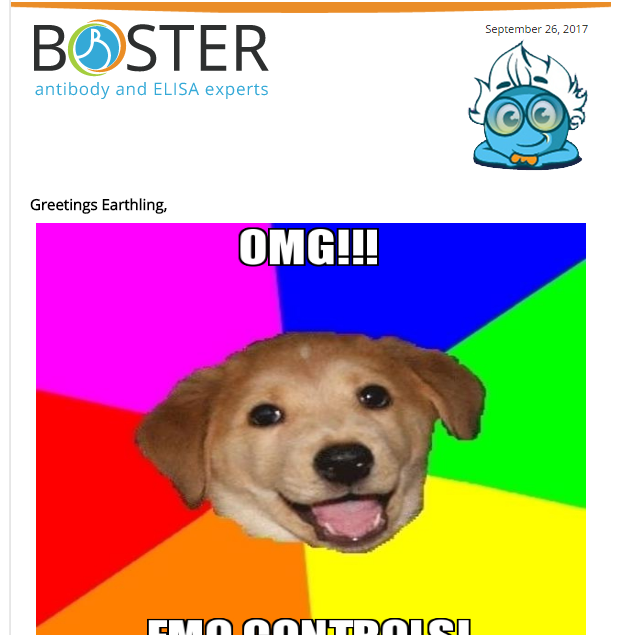 Get better results with Boster! The purpose of using a secondary antibody is to amplify the primary antibody and antigen interactions signals. 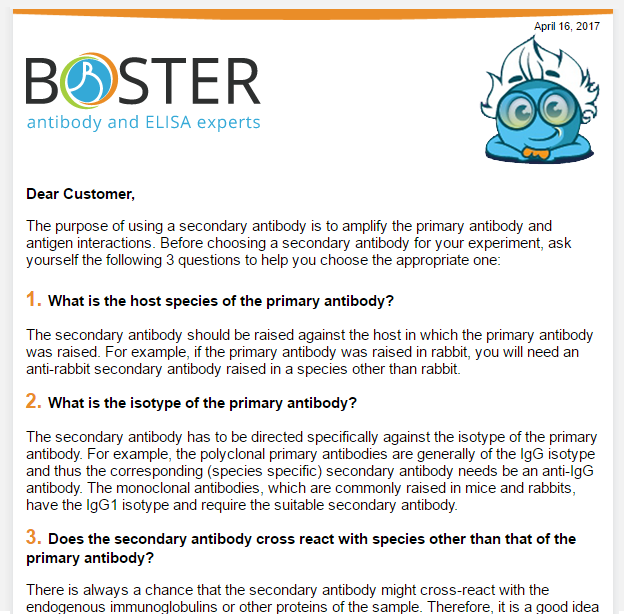 If you need secondary antibodies for your experiment, then you probably know there are many elements to consider when choosing the right antibody such as species reactivity. Dr. 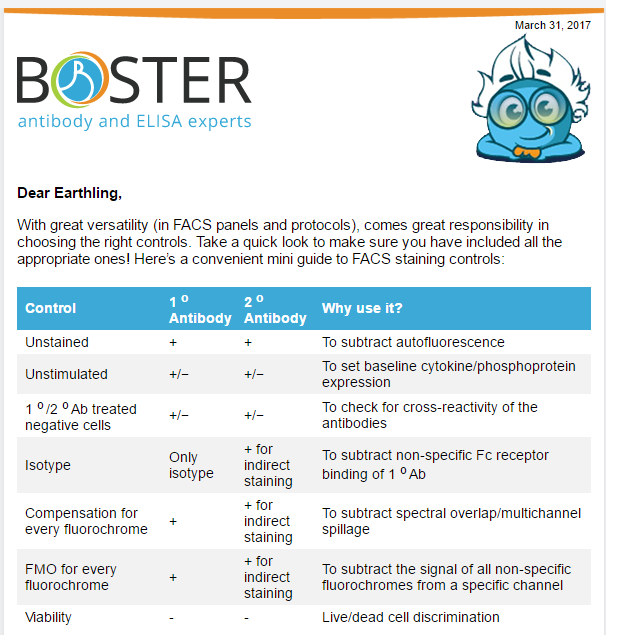 Booster has a few guidelines for you to keep in mind about secondary antibodies. Be sure to take a look and confirm everything is good to go. With today's selection of fluorochromes, FACS panels can become quite complex. Working with multiple colors and antibodies will require the appropriate experimental controls in order to properly interpret the data results. Check to make sure you have included all the appropriate controls before your cell sorting experiment! This convenient mini guide to FACS staining controls by Dr. Booster should be a helpful reference tool. Are you preparing for a FACS experiment? Here’s a 10 point checklist to help you get ready prior to cell sorting. 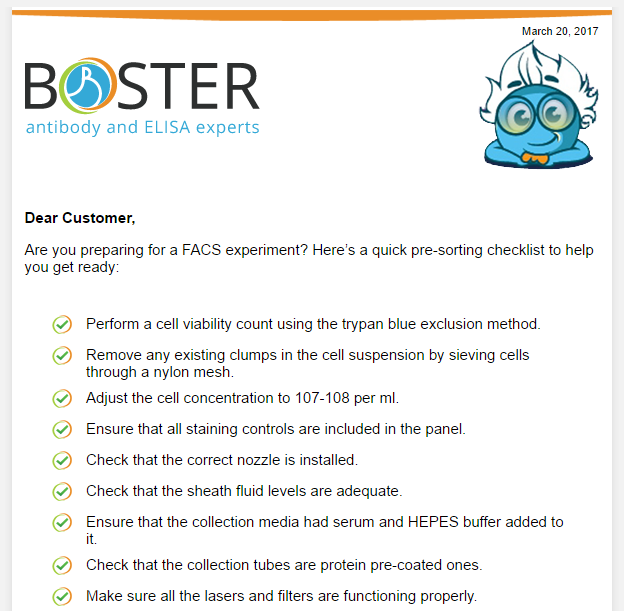 We suggest going through this checklist beforehand, as your cell sorting process may go more quickly and efficiently if you read the following tips.